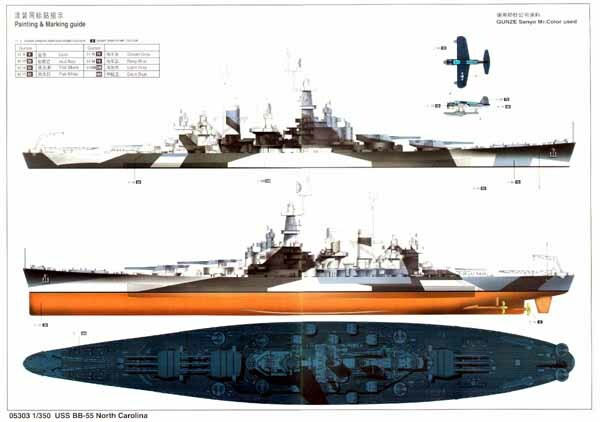 The North Carolina Class Battleship was a radical departure from earlier designs. 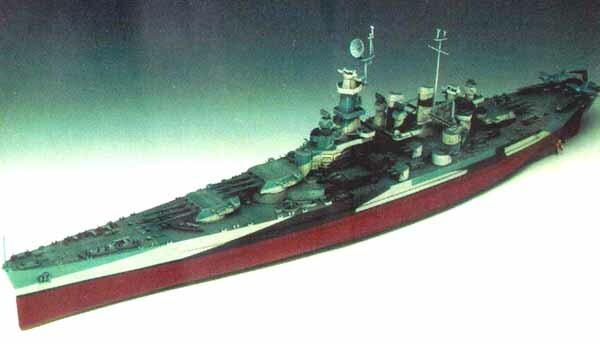 There long sleek shape was the fore runner of the more modern Iowa Class BB's. 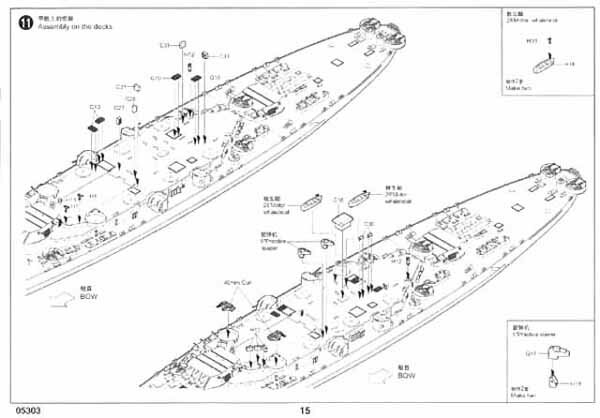 Both the North Carolina and her sister ship the Washington had rather storied careers, serving in both theaters of war in battles from Guadalcanal to the Japanese mainland. 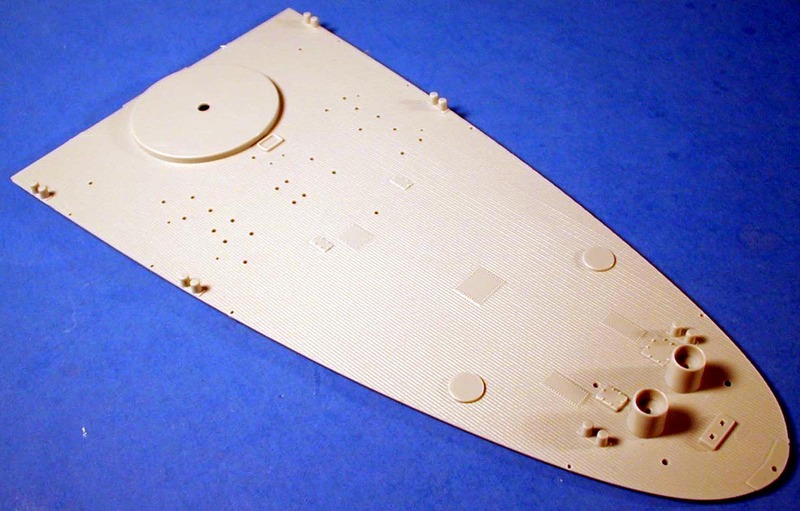 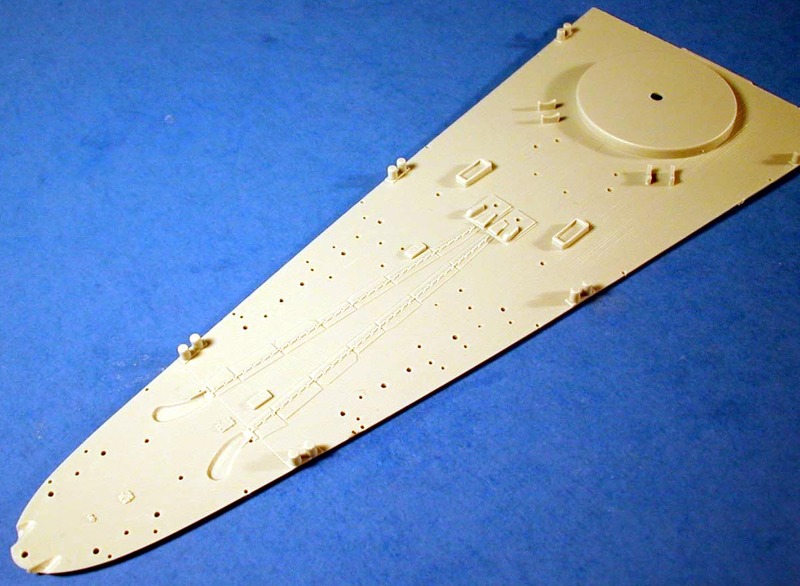 This latest kit from Trumpeter will allow you to do most any version of this ship or her sister ship. 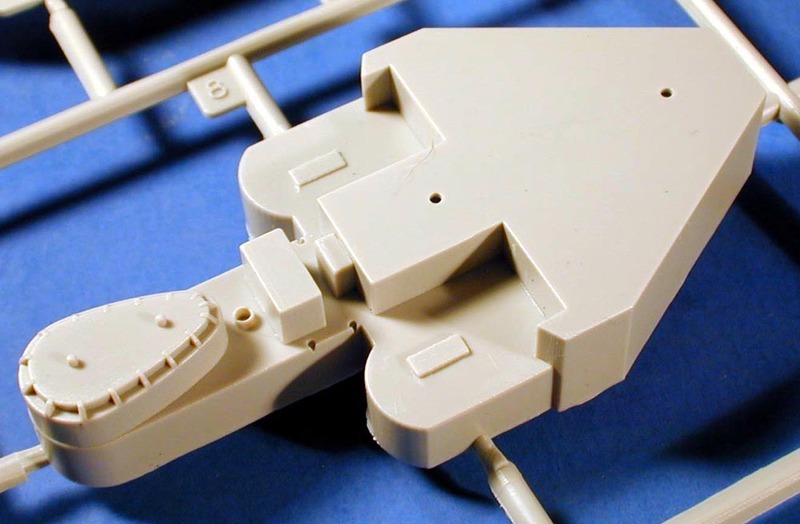 Thanks to the innovative design that removes the molded on splinter shields, you can easily modify her light gun fit. 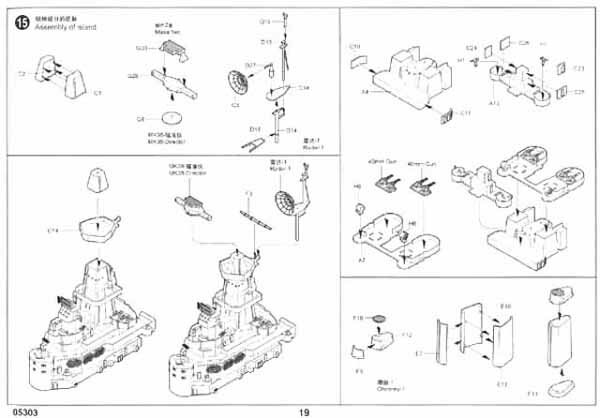 The deck is molded in three parts. 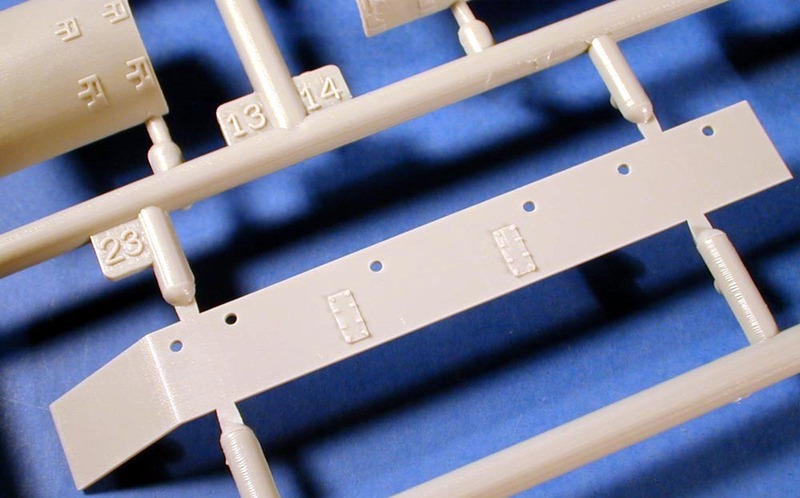 The surface detail is very nice, with realistic planking and really nice hatches and plates molded on with latch and bolt detail that is really sharp. 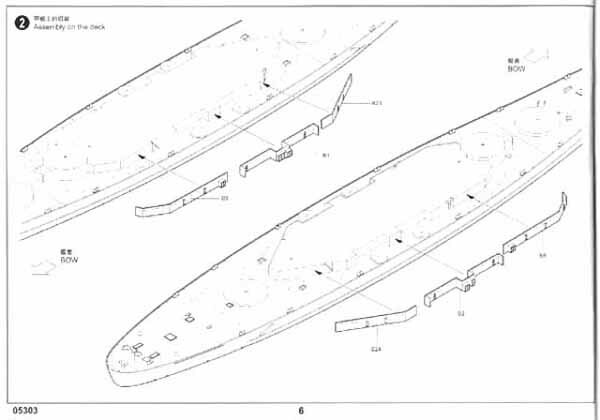 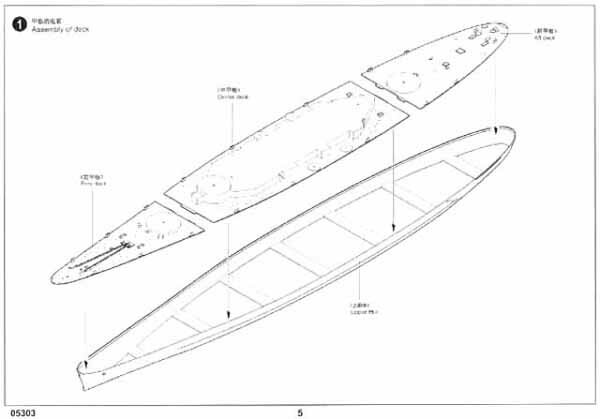 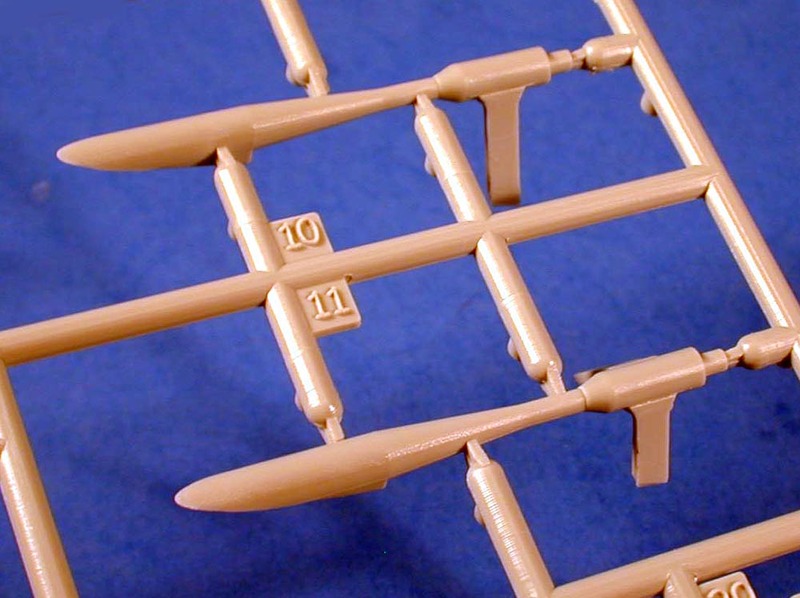 As mentioned above the splinter shields for the 20 mm guns are separate though there are locator holes for them. 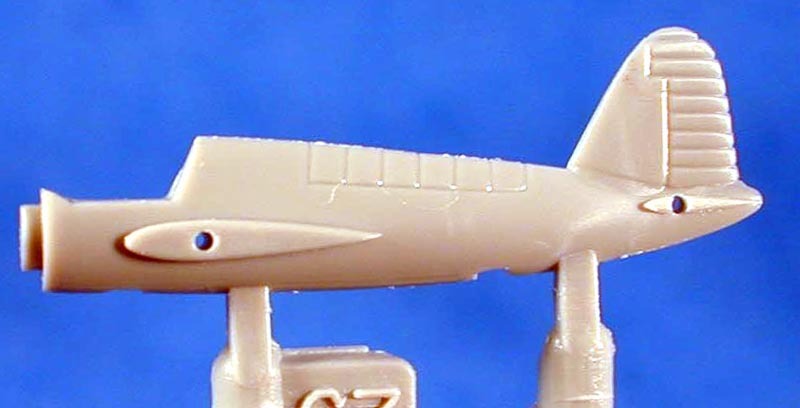 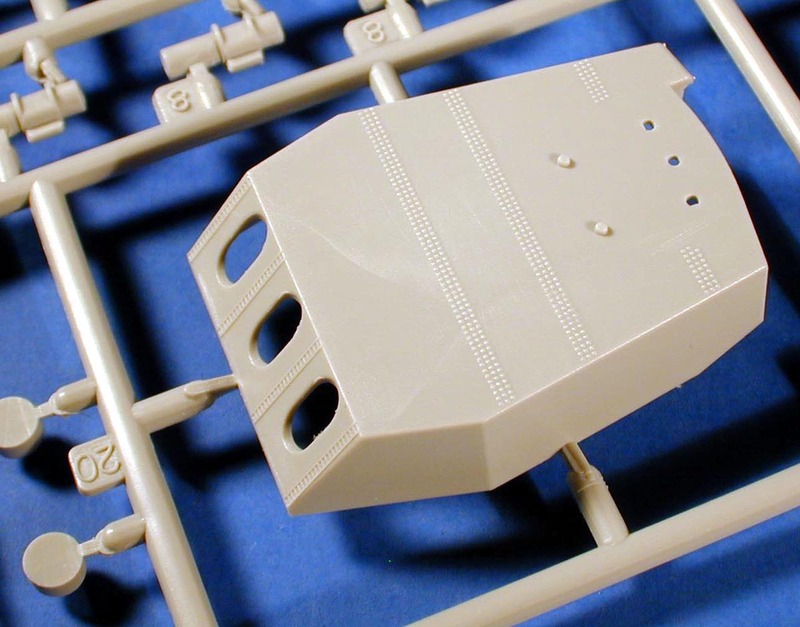 Some modelers who are backdating the kit might not be happy having to fill those holes, but it is far easier than trying to scrape off a molded on splinter shield. 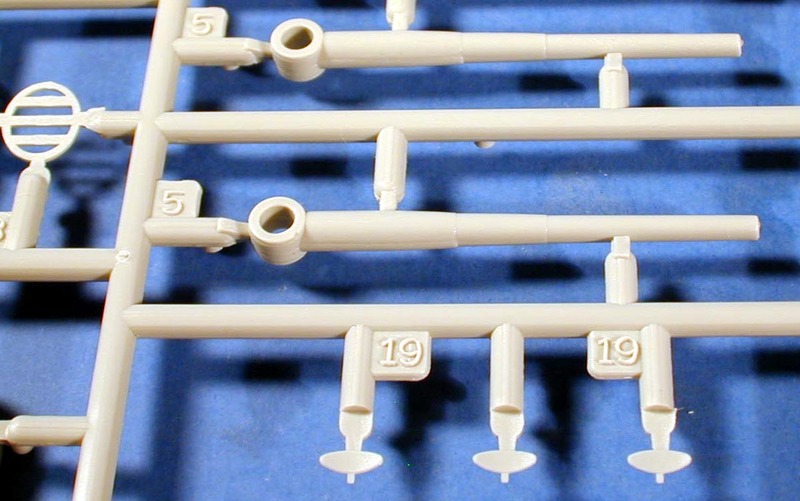 If an early version is desired simply drill out the holes to allow a piece of plastic rod to be glued in. 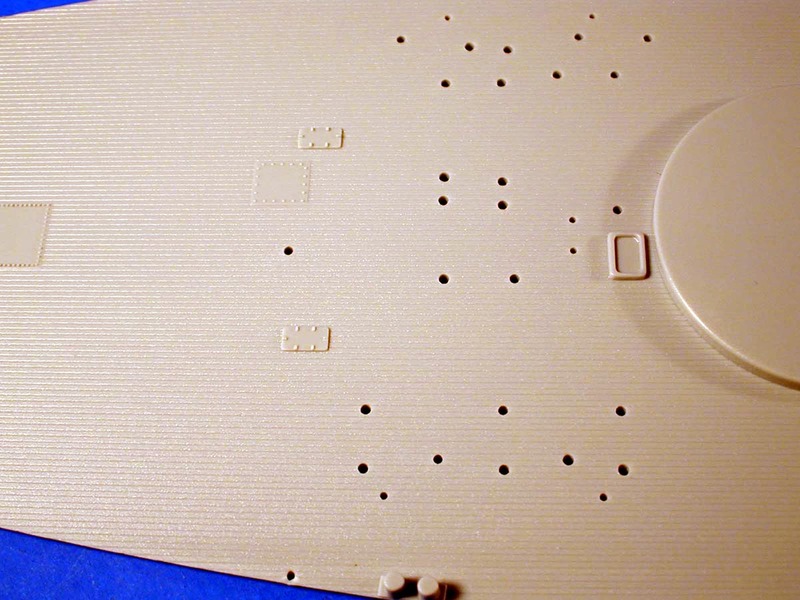 Thanks to the correct recessed planking, it will be easy to rescribe over the holes. 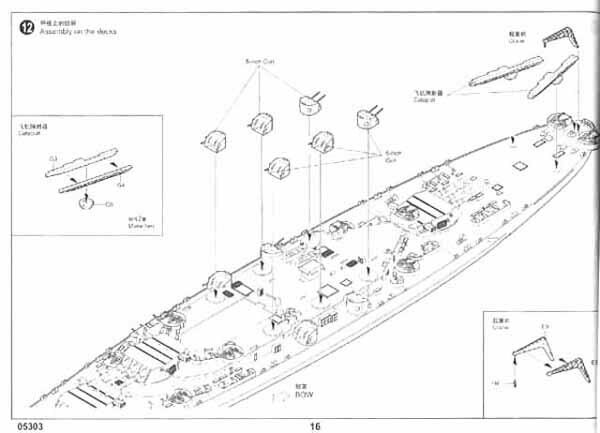 The mid deck and superstructure insert also has the same nice deck planking. 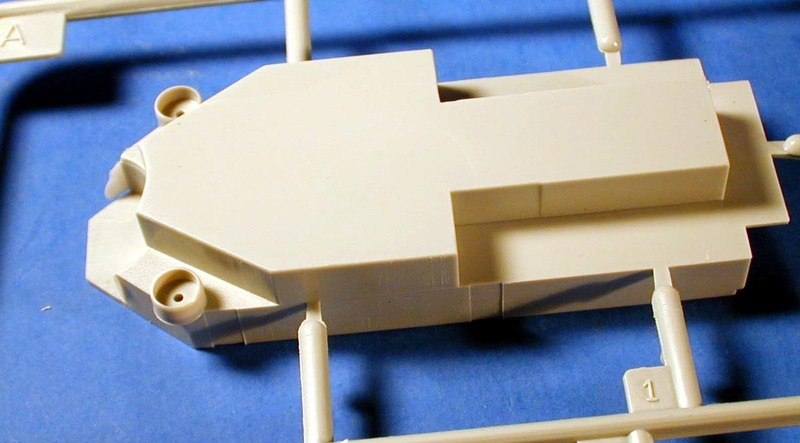 At first glance you might notice that the walls are devoid of detail and there appears to be some of those dreaded Aztec stairs. 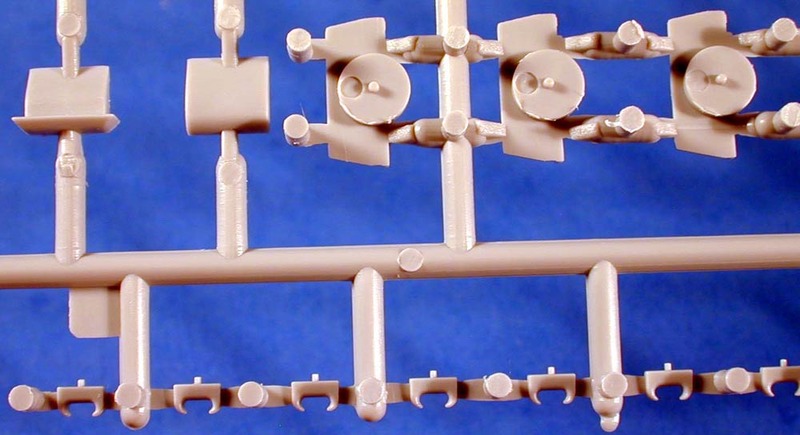 But never fear, the walls for this are included on Sprue B. 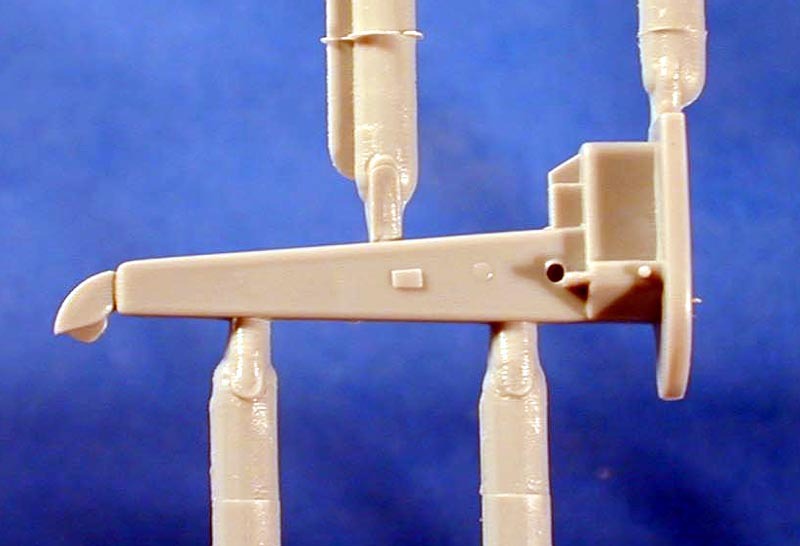 Those Aztec stairs are in fact a stairway disappearing under the deck on sprue E. A really cool feature. 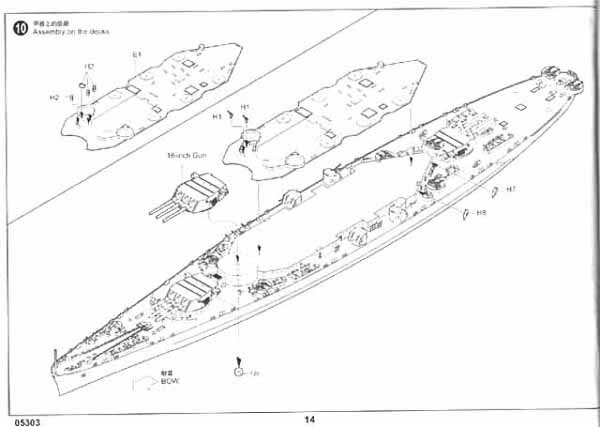 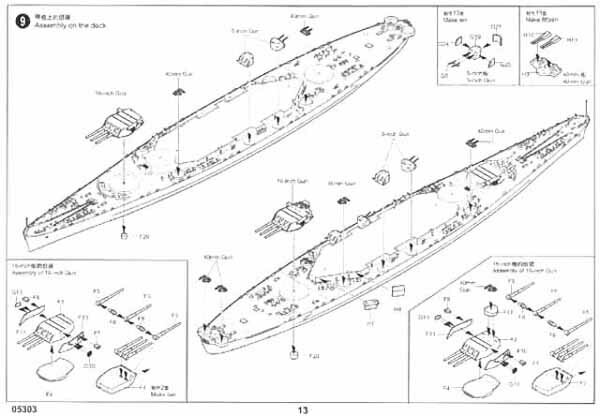 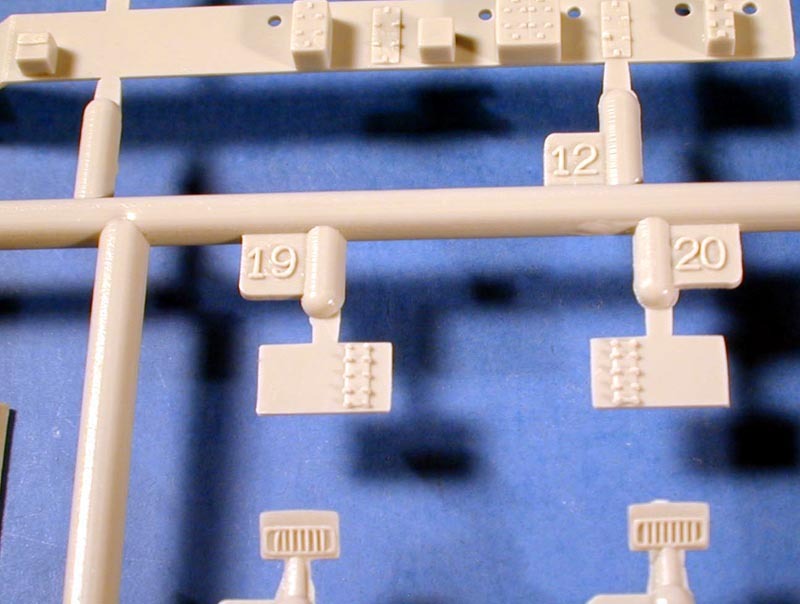 The main superstructure parts are on this sprue. 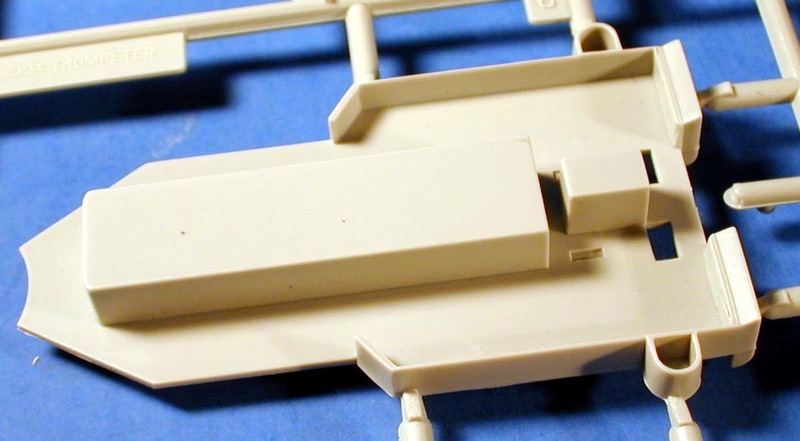 Some appear to be rather plain until you consider the separate walls that attach to them. 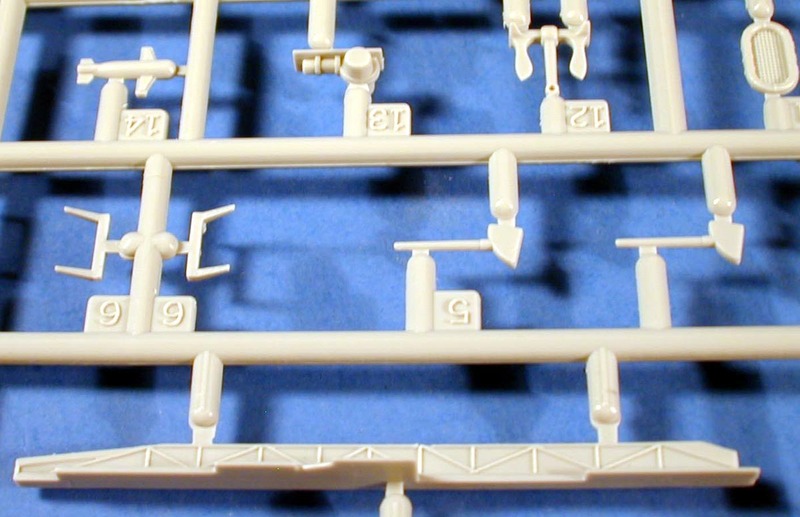 You will notice that most of the platforms have bracing molded underneath them. 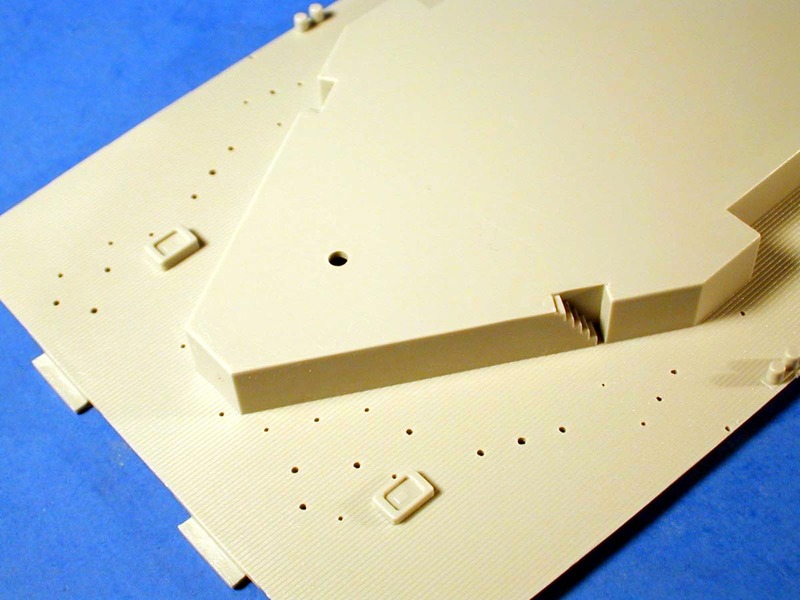 Splinter shields are very fine for injection molding. 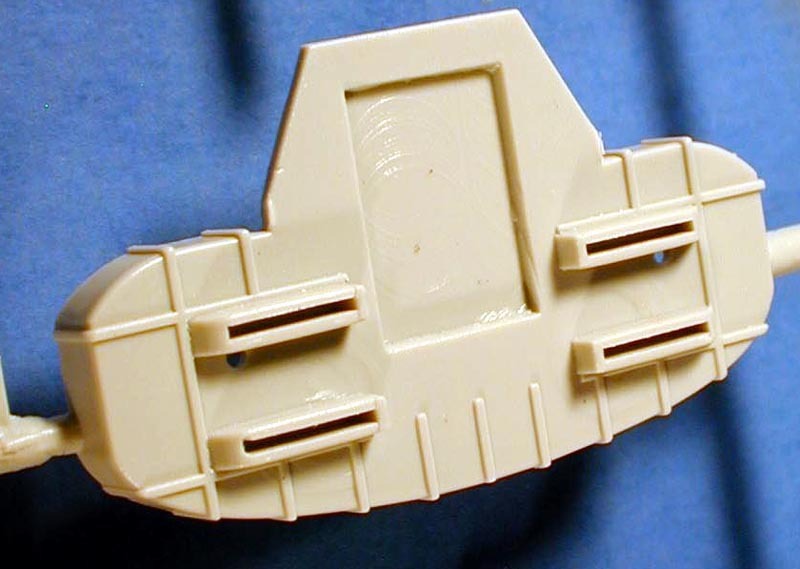 Many of the deck levels also have ammo boxes molded on. 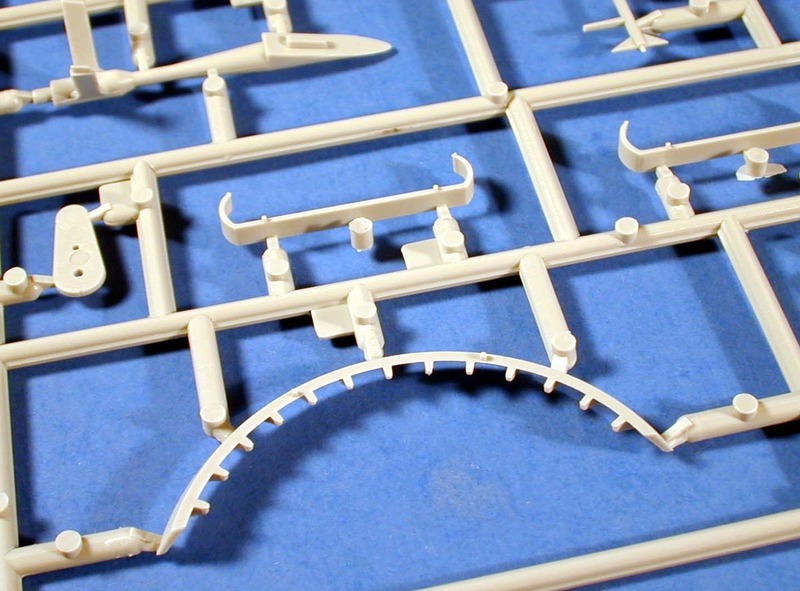 These have the same sharp details as the other parts. 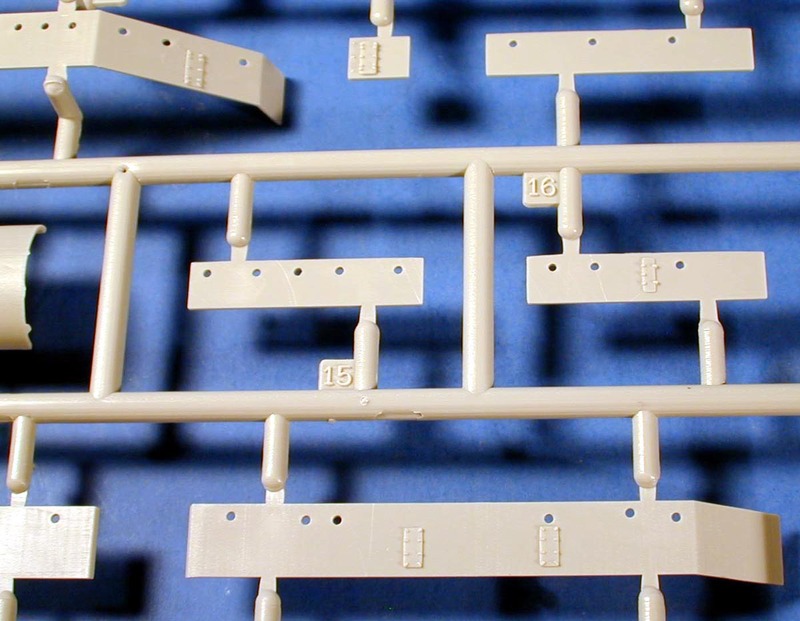 This sprue has the many walls of the superstructure. 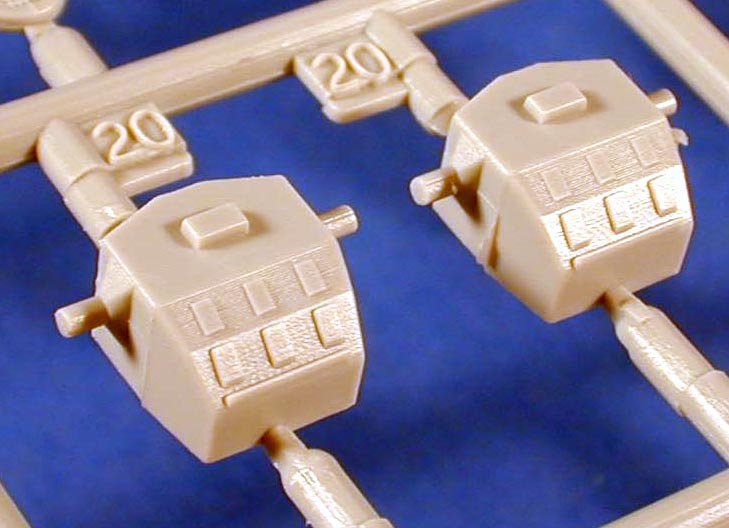 These are really nice many with open portholes and lockers, hatches, and other details molded on. 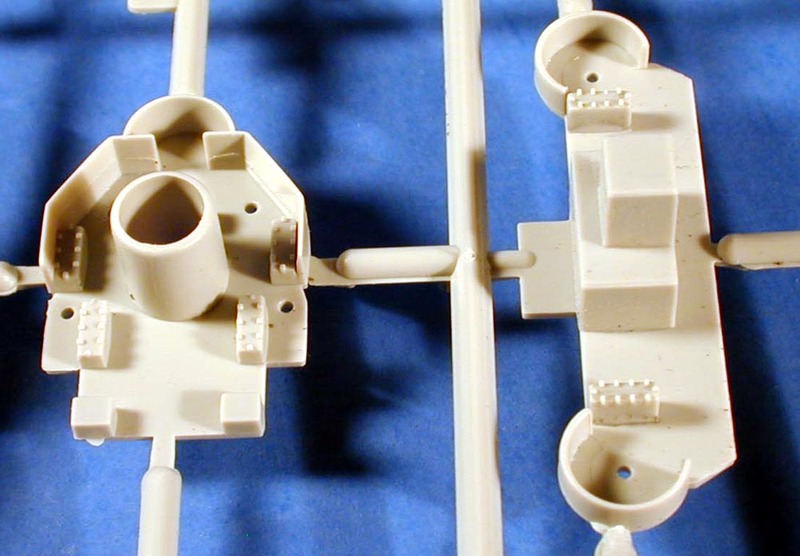 This approach to construction will make it easy to modify this kit to early war fits. 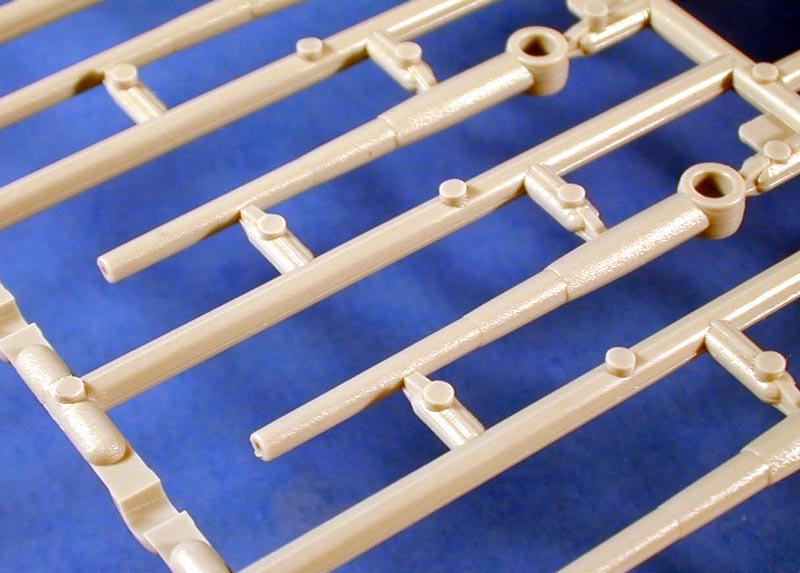 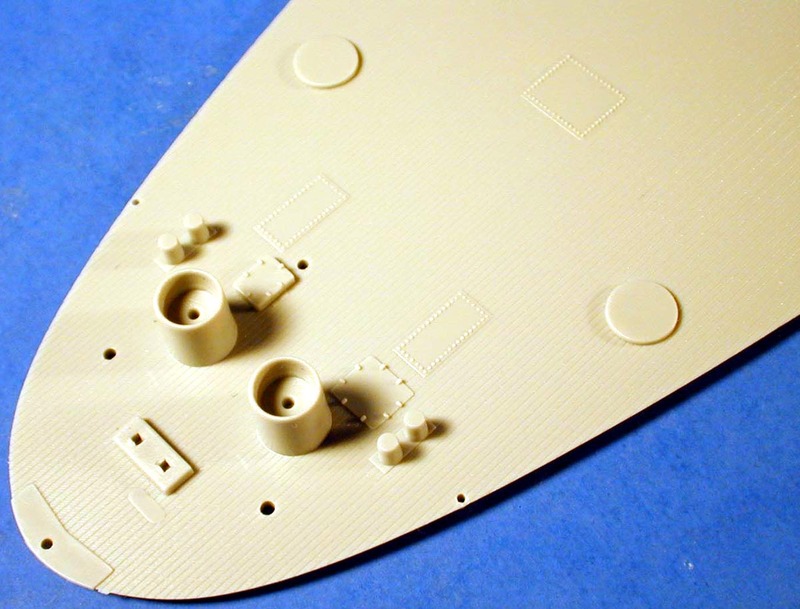 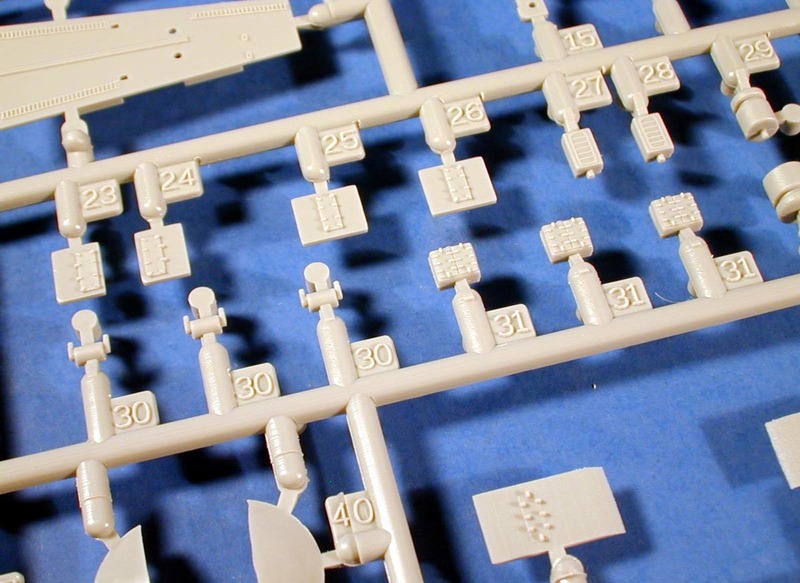 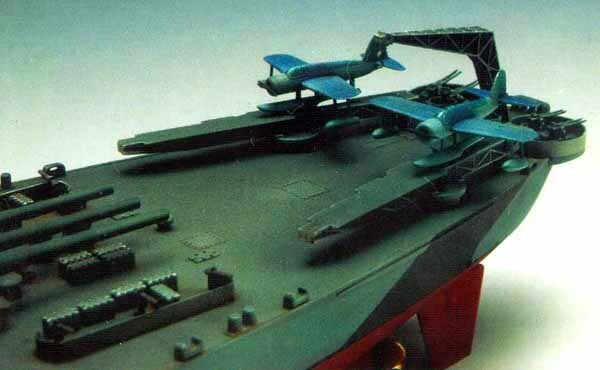 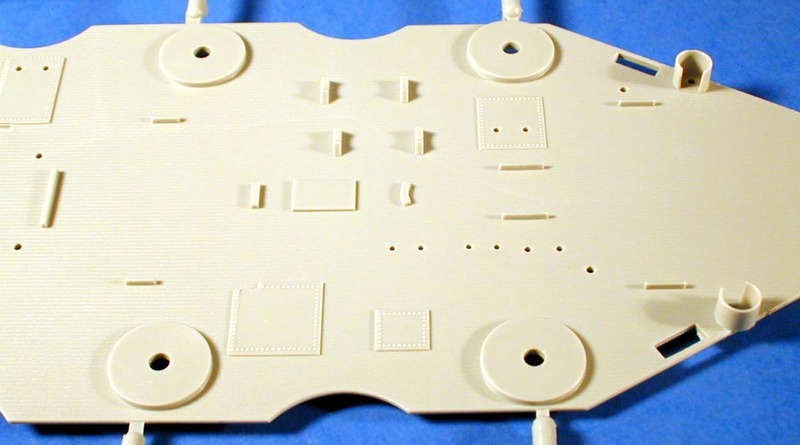 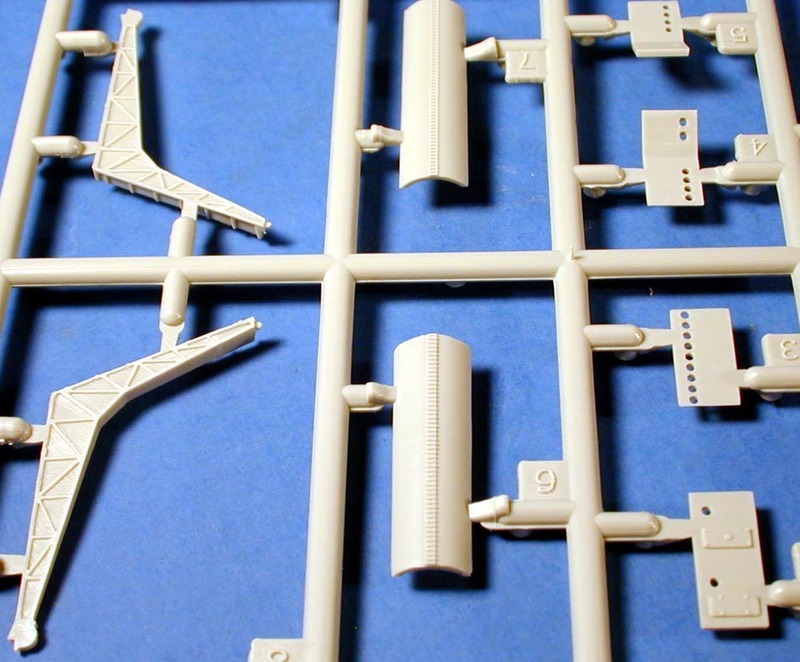 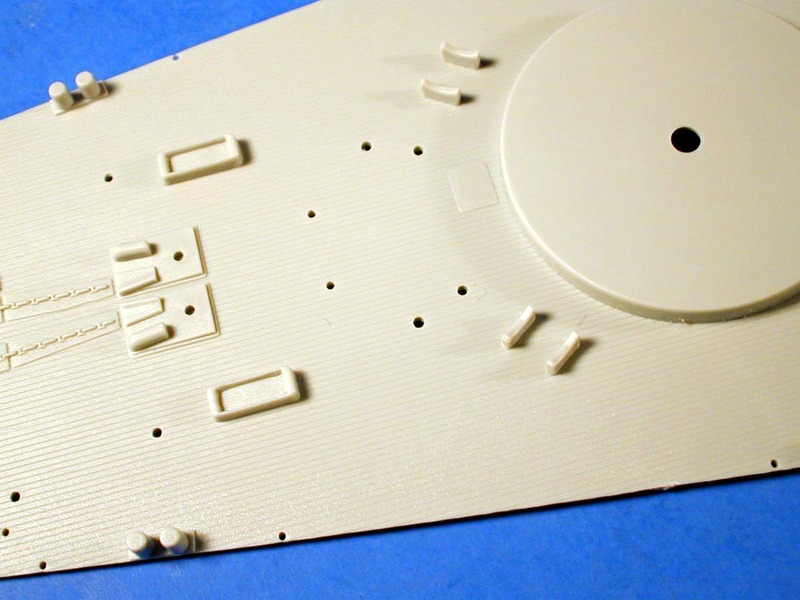 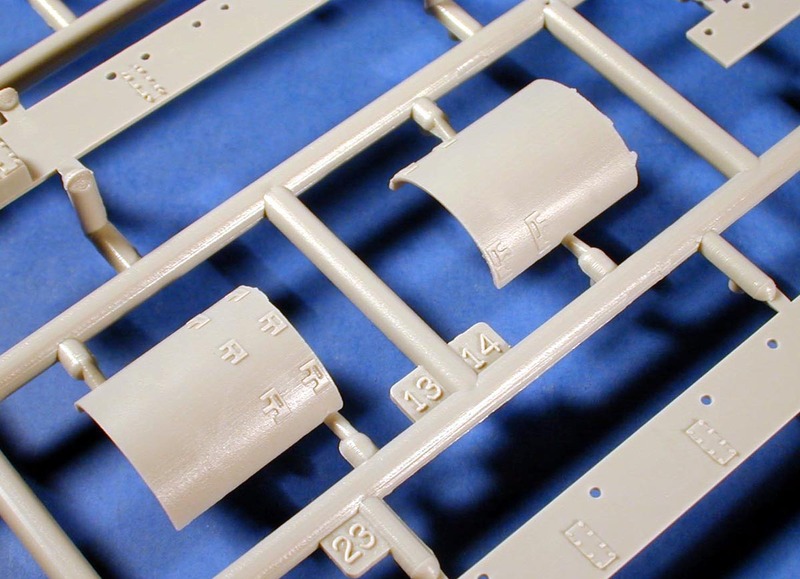 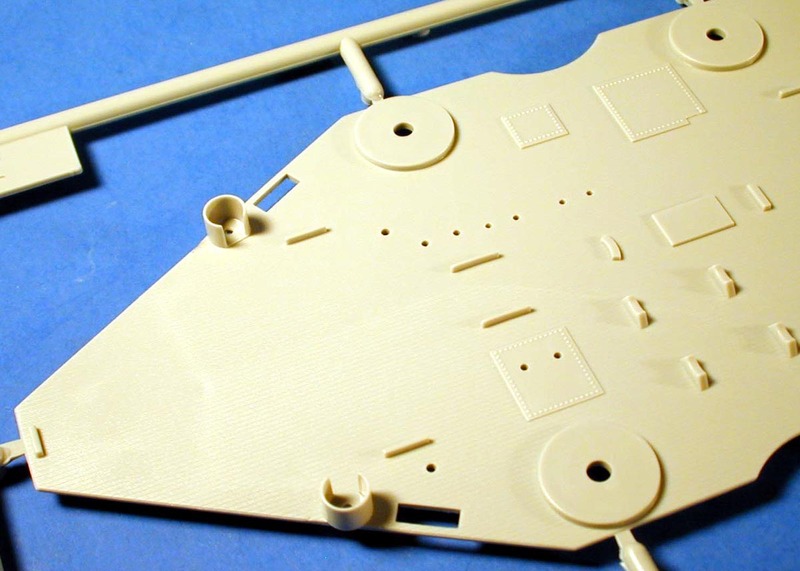 This sprue has the remaining parts of the superstructure and various other platforms. 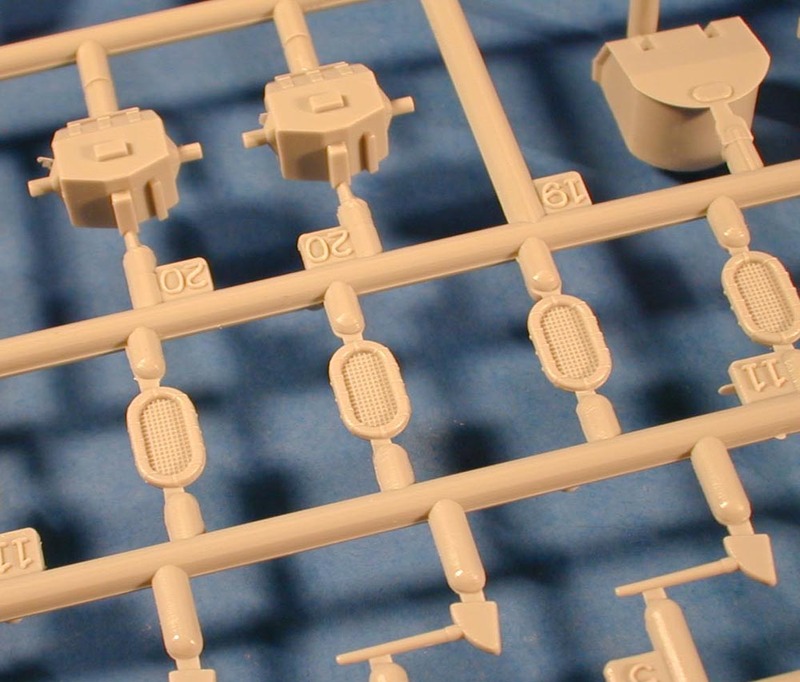 Again the molding is very well done and the parts came out very nice. 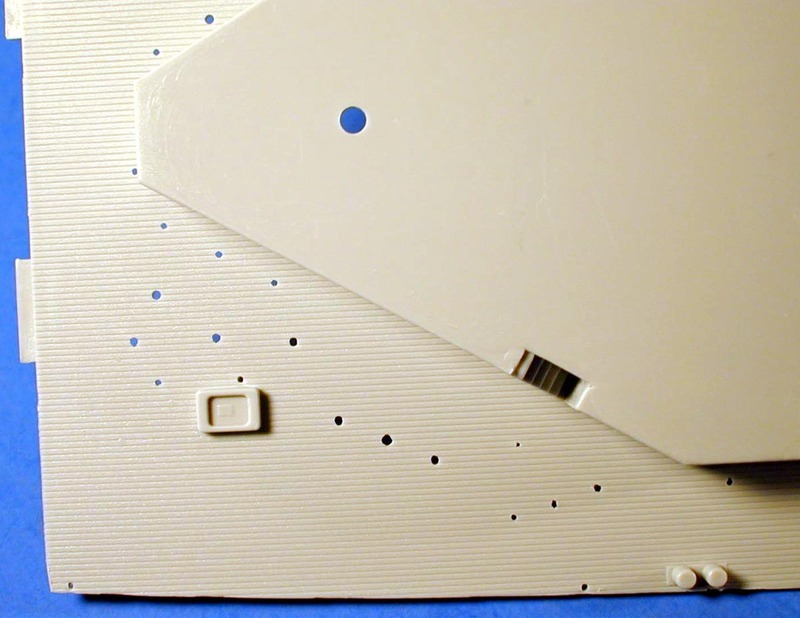 The only part I don't care for is the big SK radar dish, an item best done in photo etch. 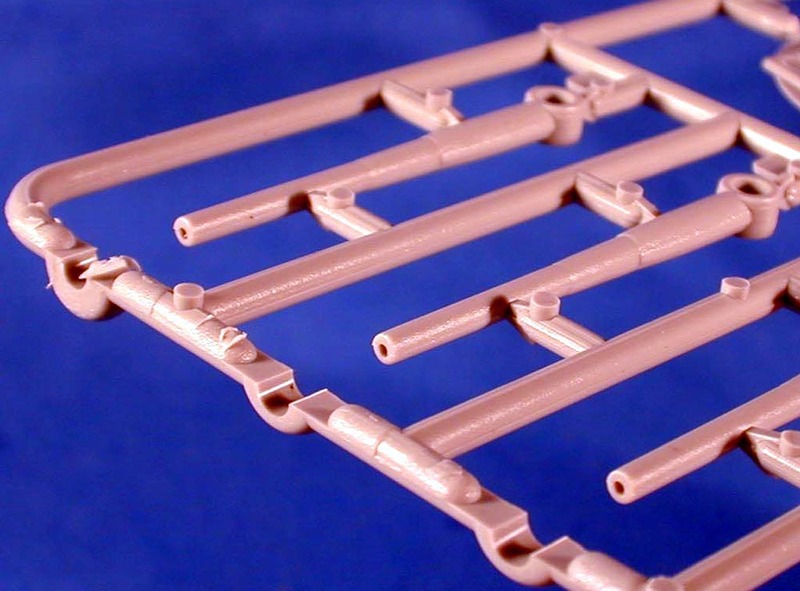 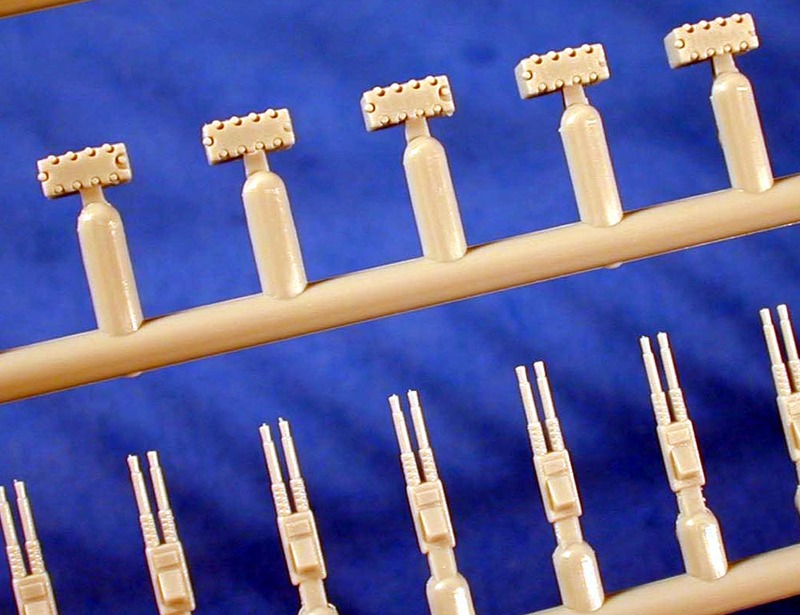 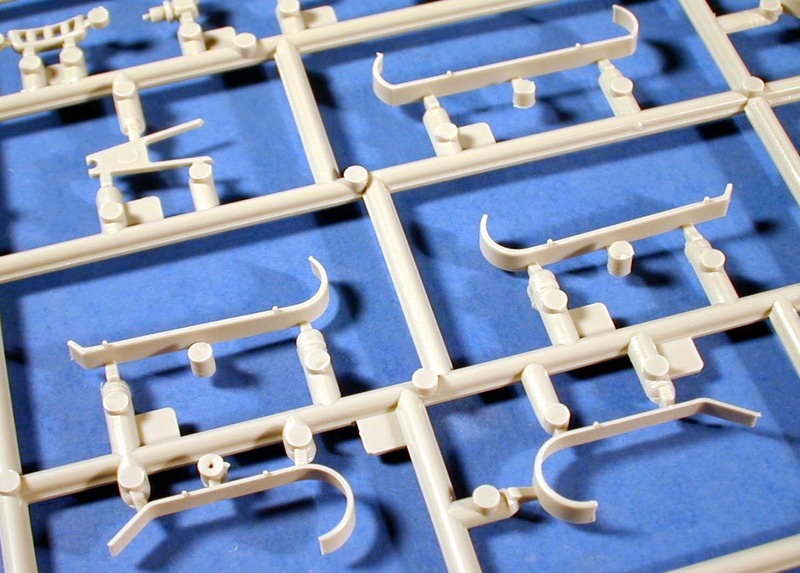 This sprue contains many of those splinter shields we mentioned above. 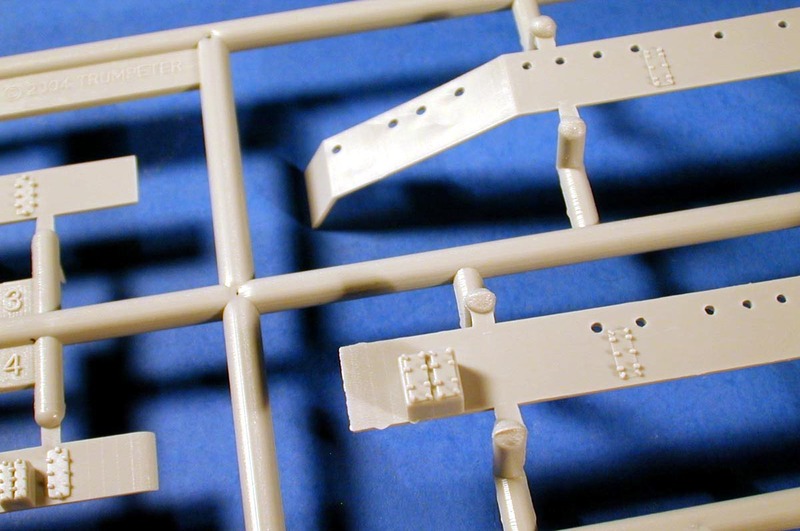 They are nice and thin and molded with locator pins to aid in placement. 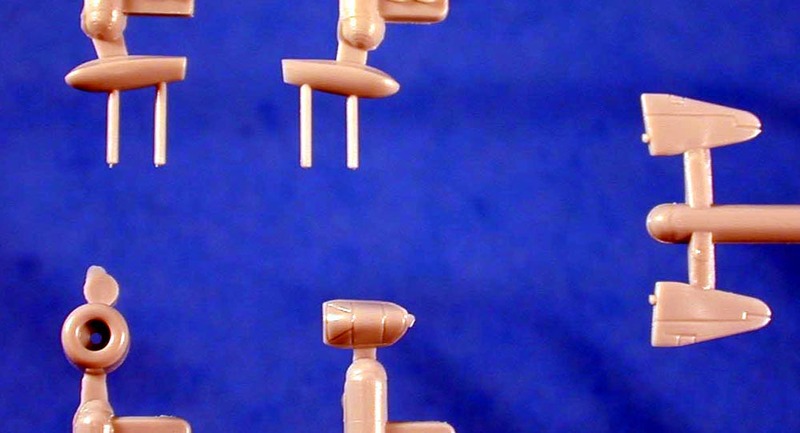 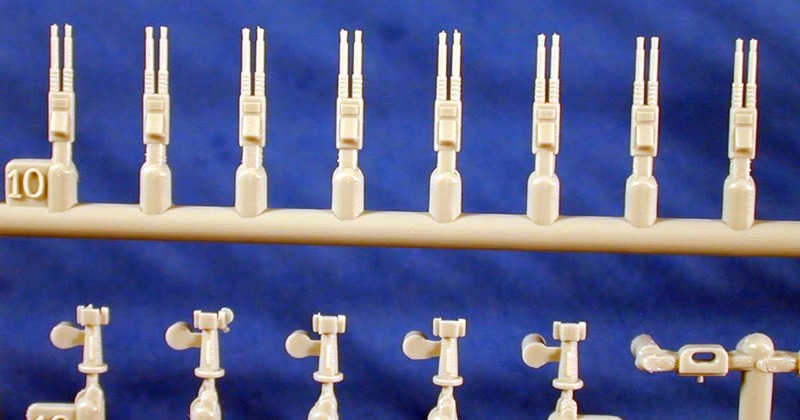 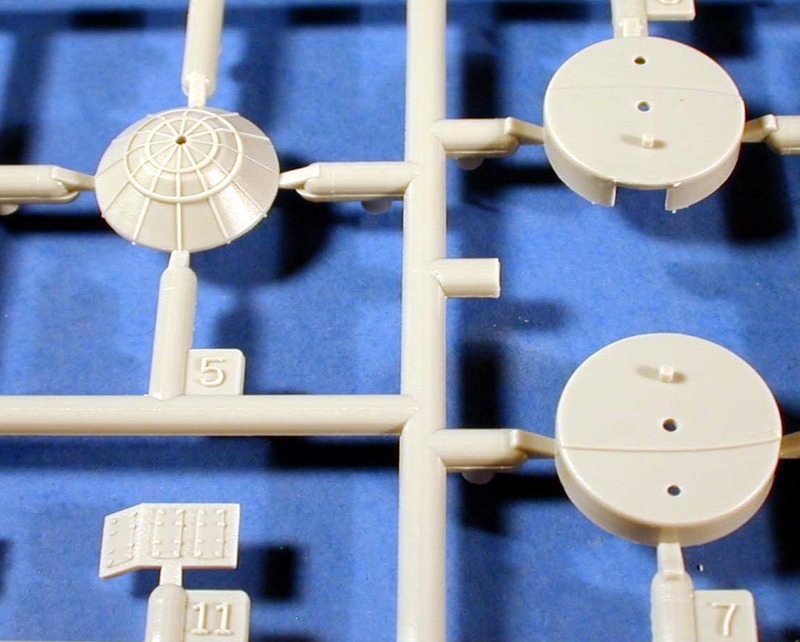 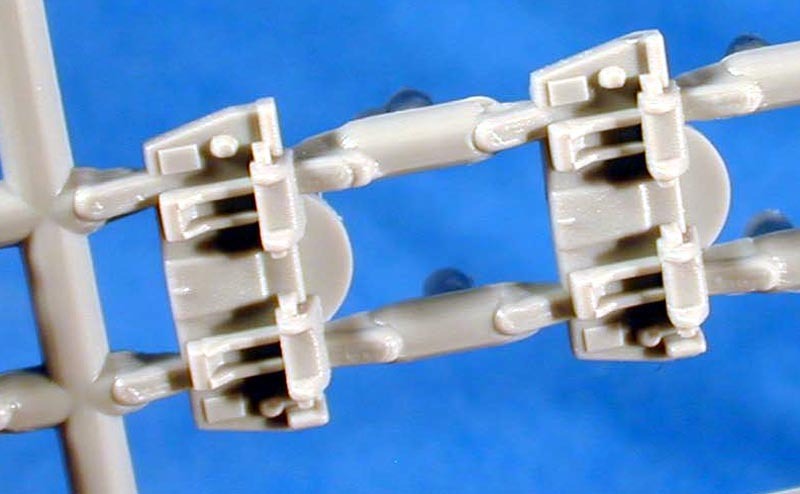 The masts and propellor shafts are also on this sprue. 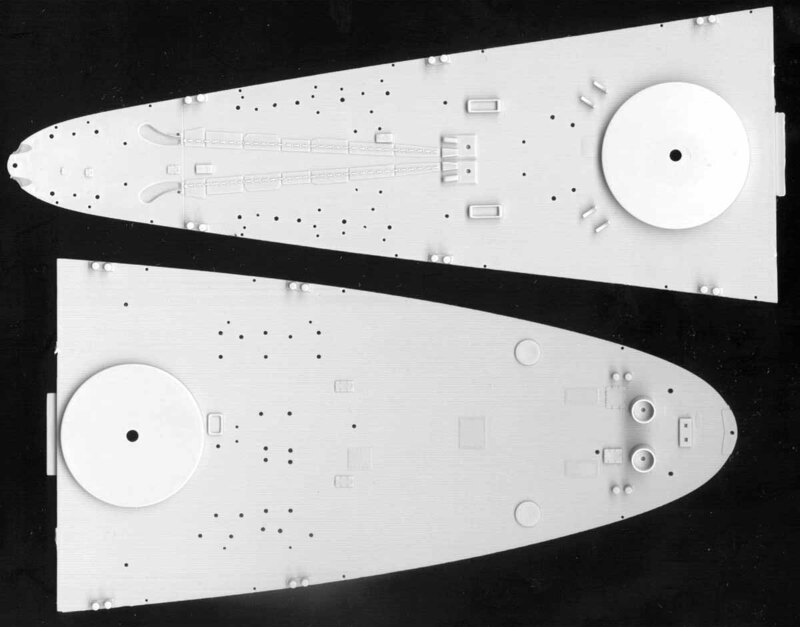 The 02 deck, like the others features sharp deck planking and plenty of surface detail. 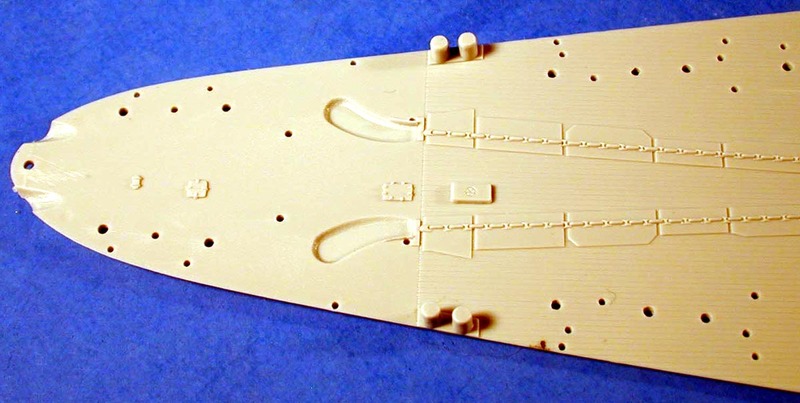 The catapults on this spure are another item best replaced with photo etch, but some modelers will be happy with the kit supplied parts. 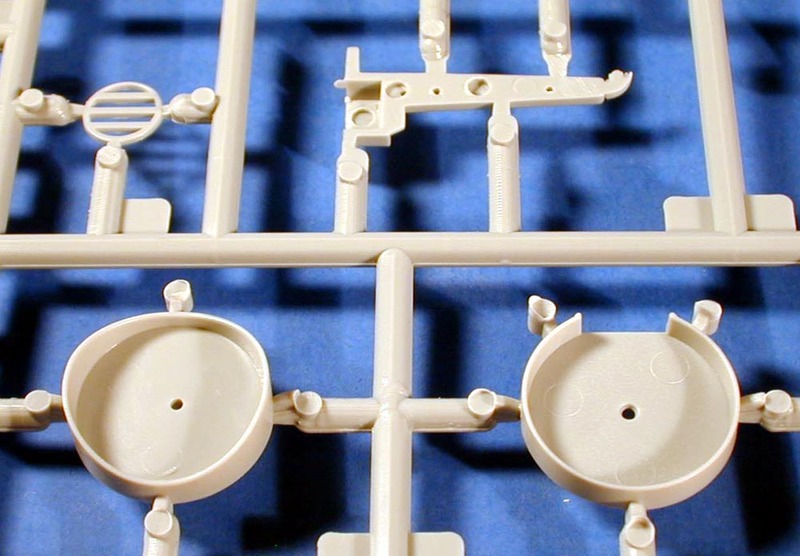 Some of the parts even have ladders molded on. 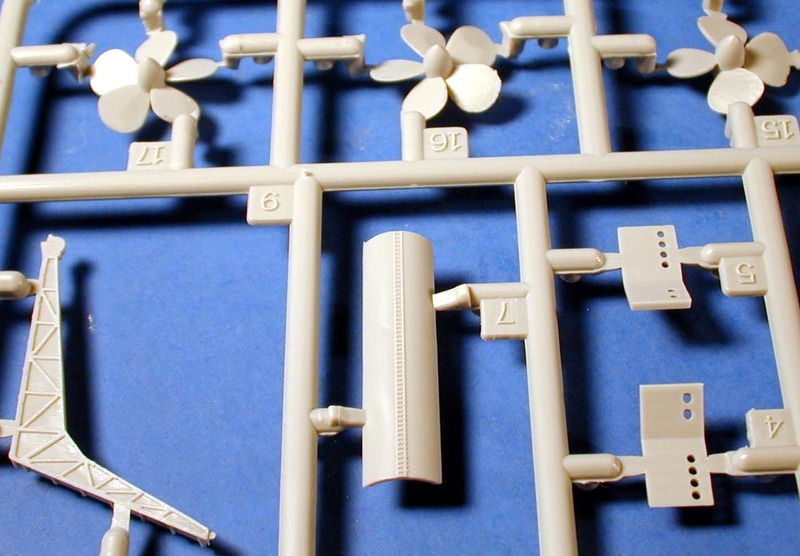 The ships propellers are well done, especially for plastic. 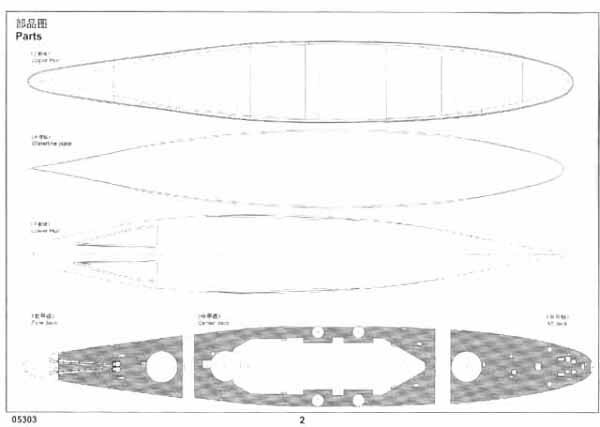 There are two five bladed, and two four bladed props with the correct left and right blade configuration. 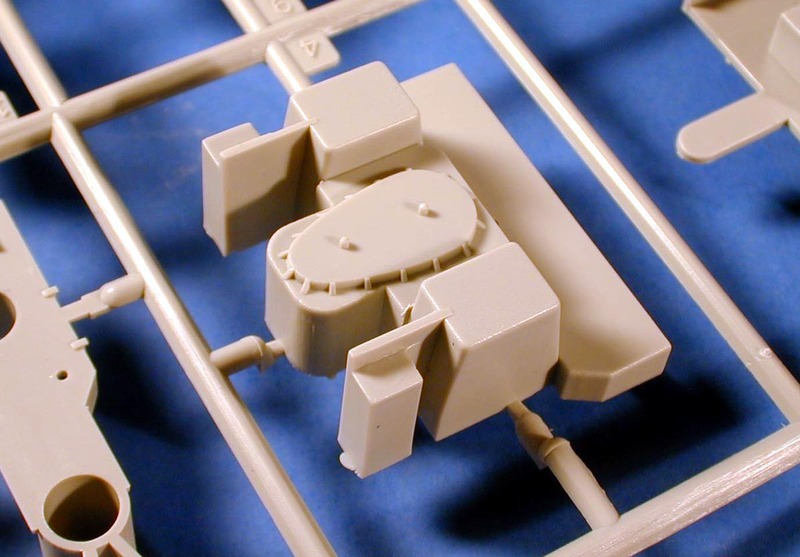 The main gun turrets seem plain until you notice the separate sides with really nice detail. 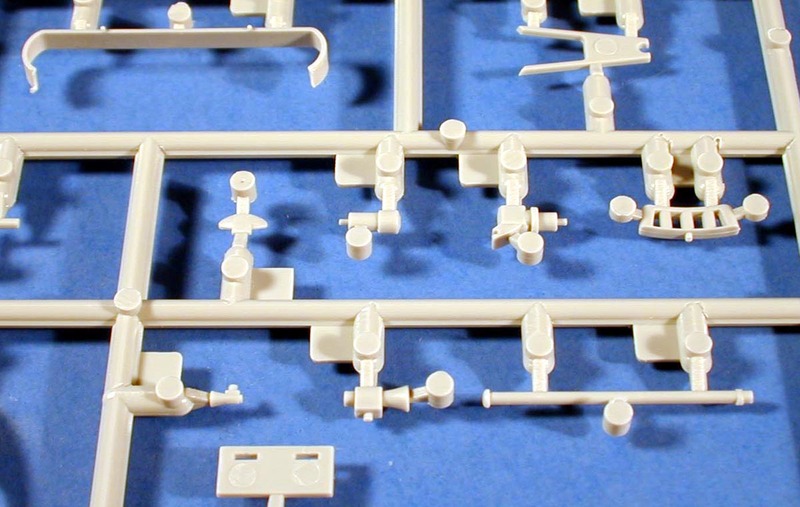 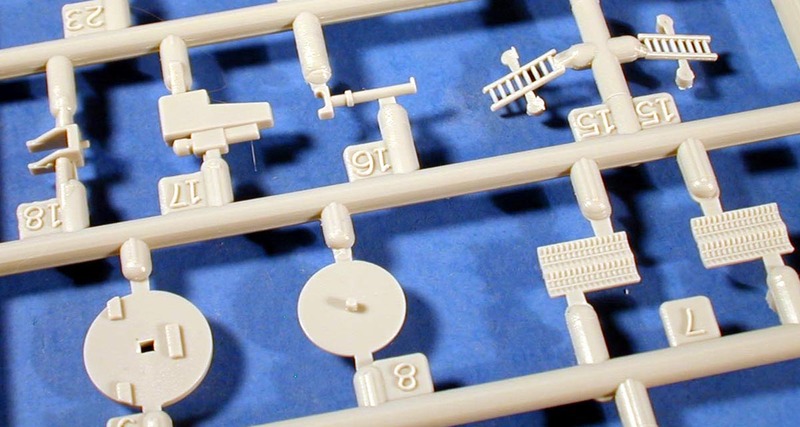 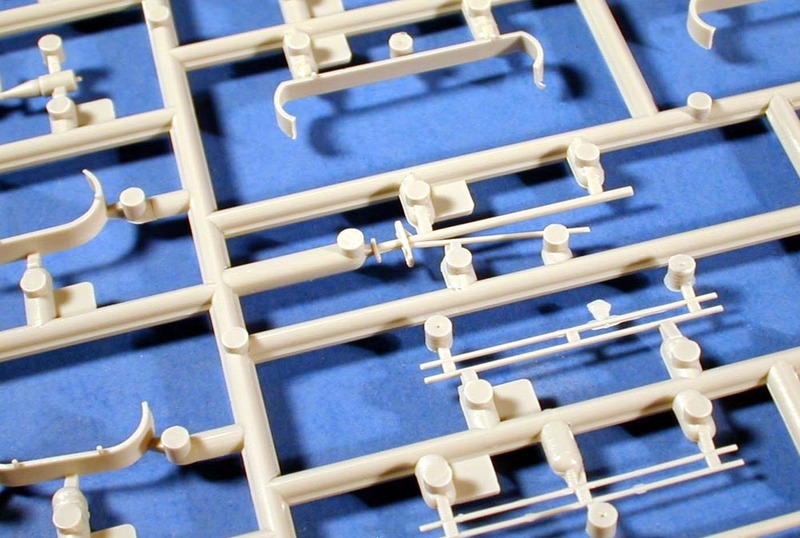 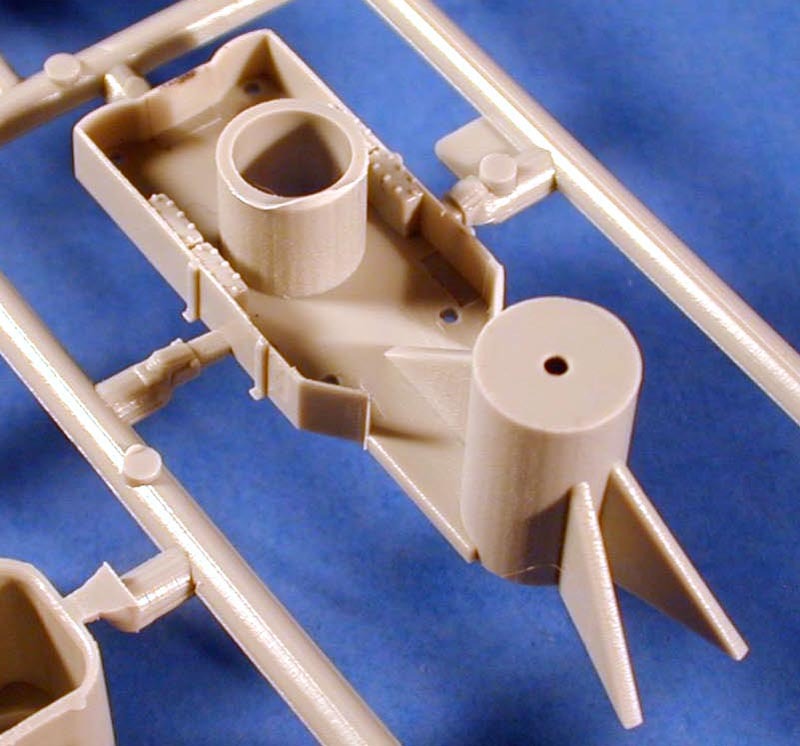 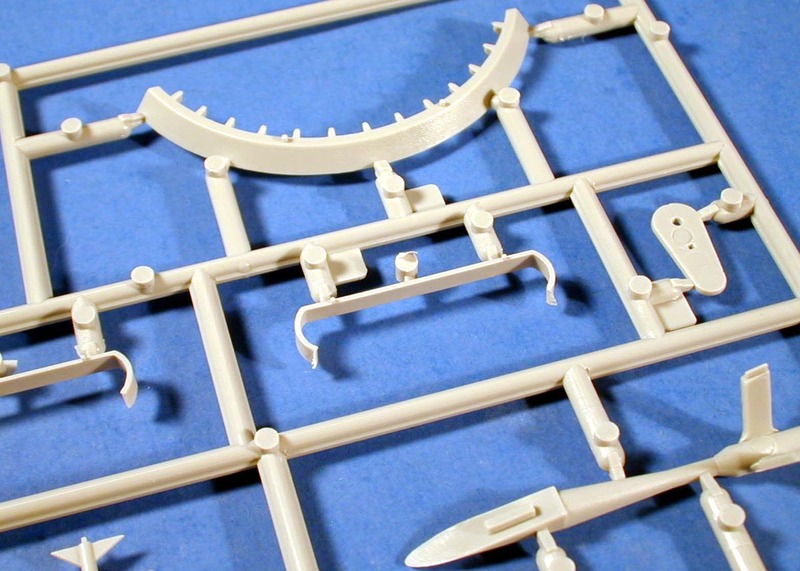 The other parts on this sprue are equally nice, but what really caught my eye was the main gun barrels. 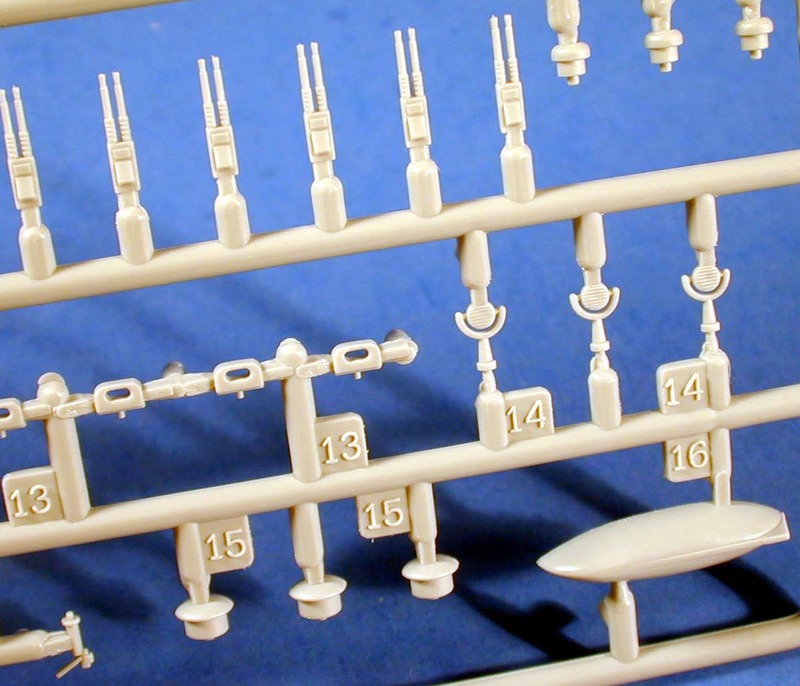 Trumpeter has included a complex slide to this mold to allow the barrels to be opened up, wow! 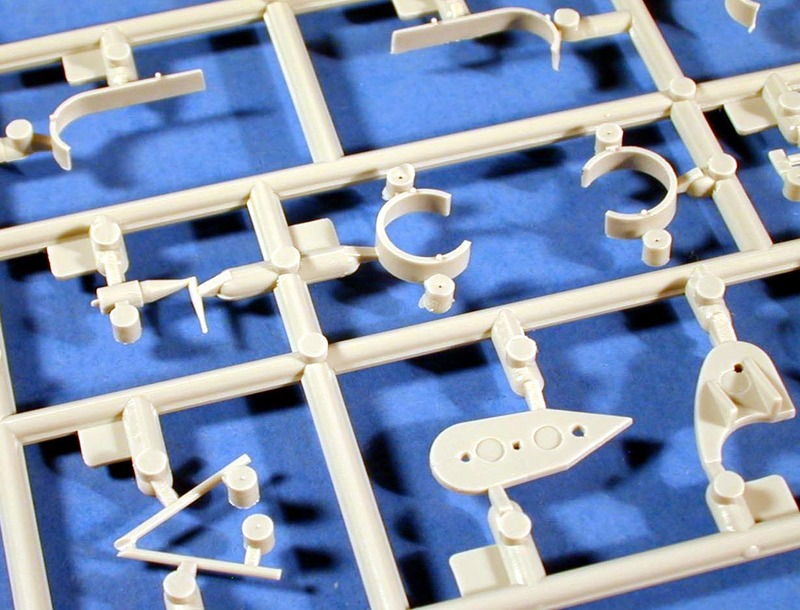 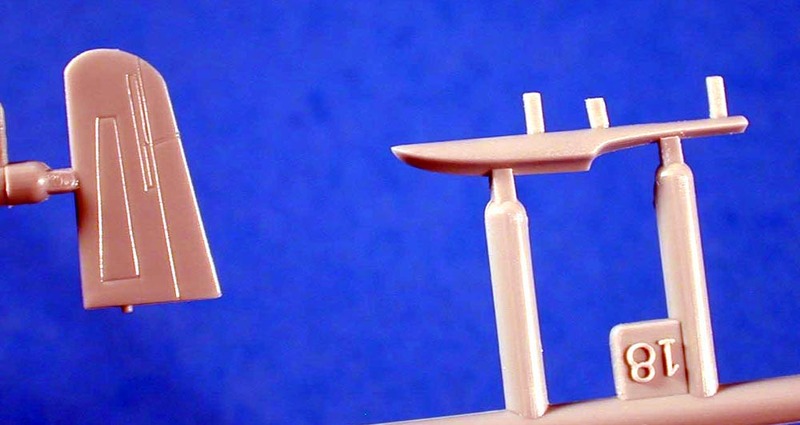 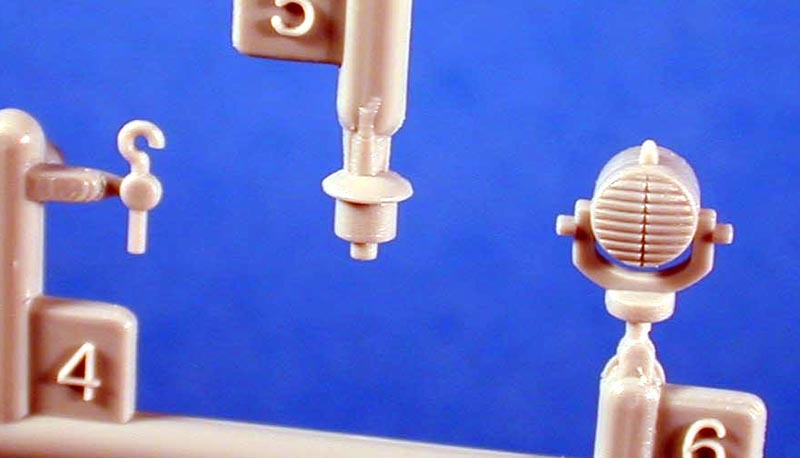 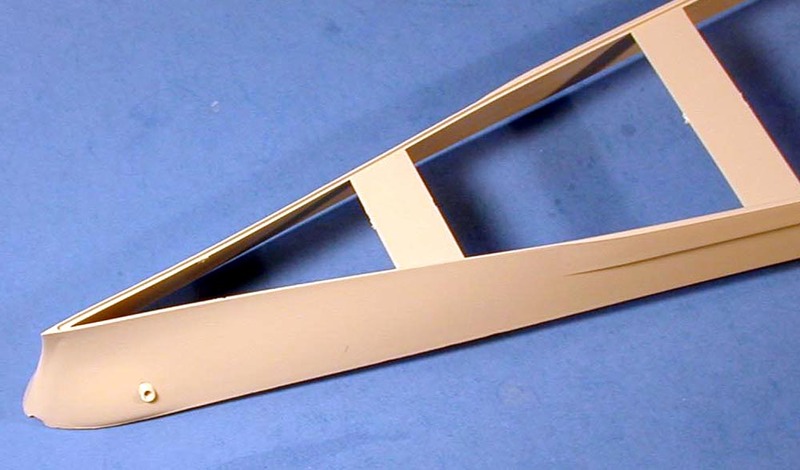 There are two of these sprues in the kit, meaning you are going to have some extra parts for the spare parts box. 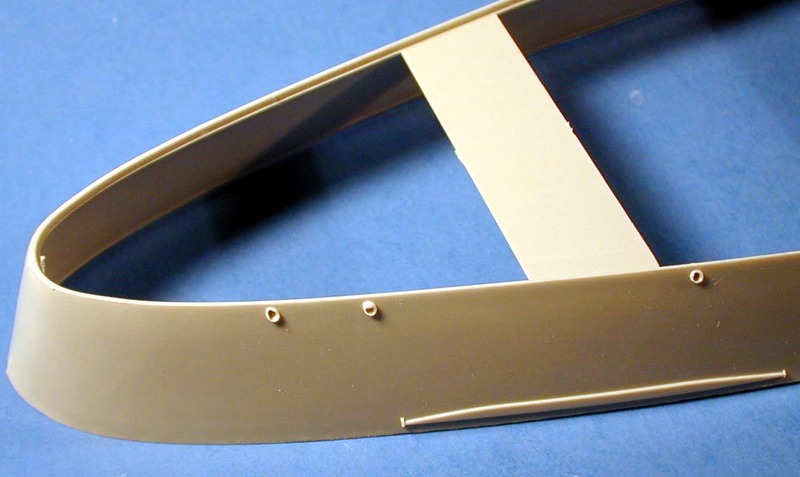 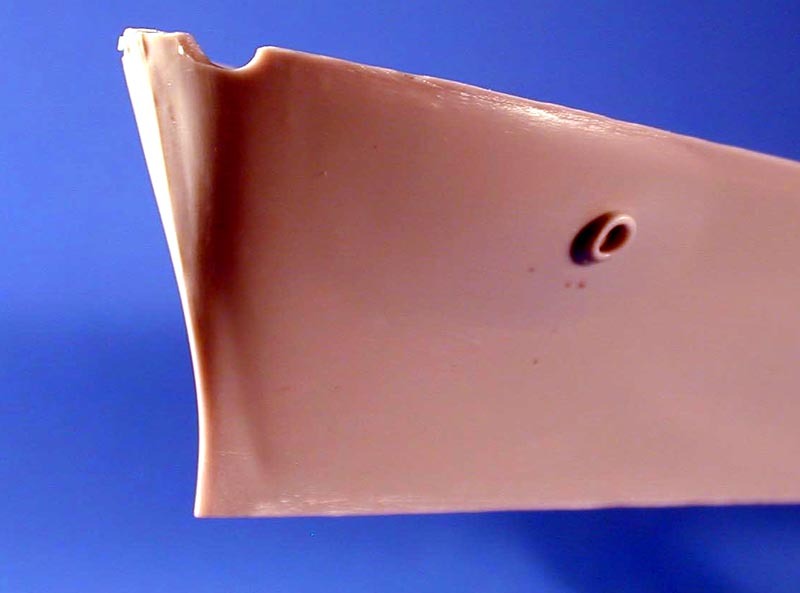 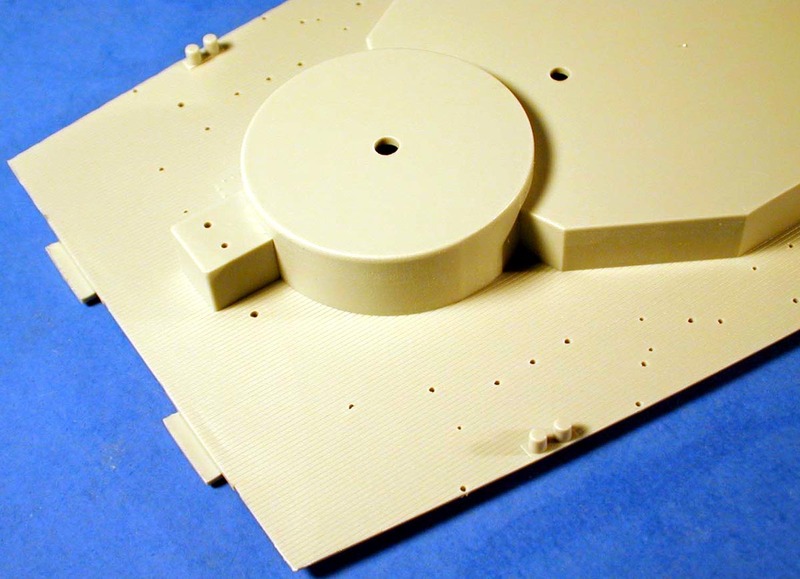 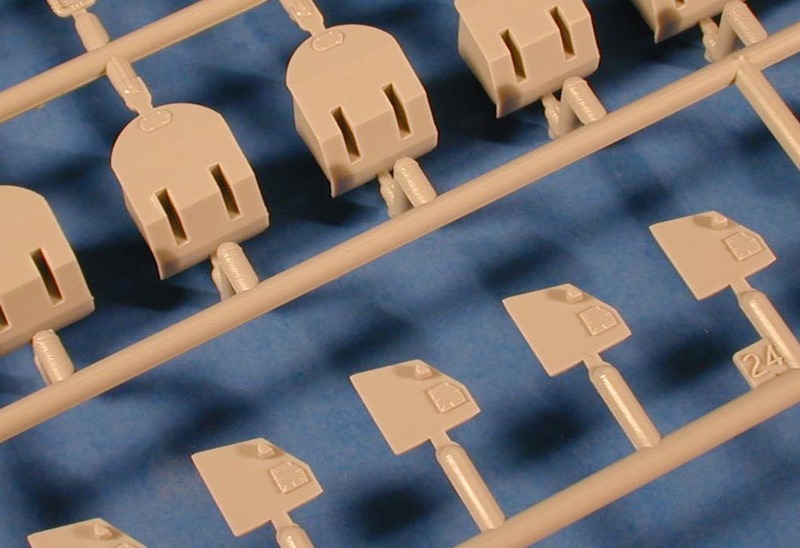 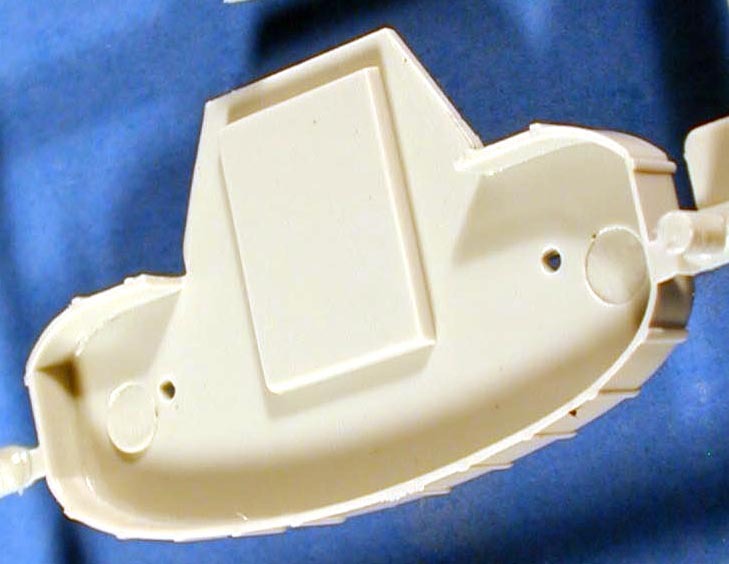 In injection molding it is hard to mold detail on all sides of a part. 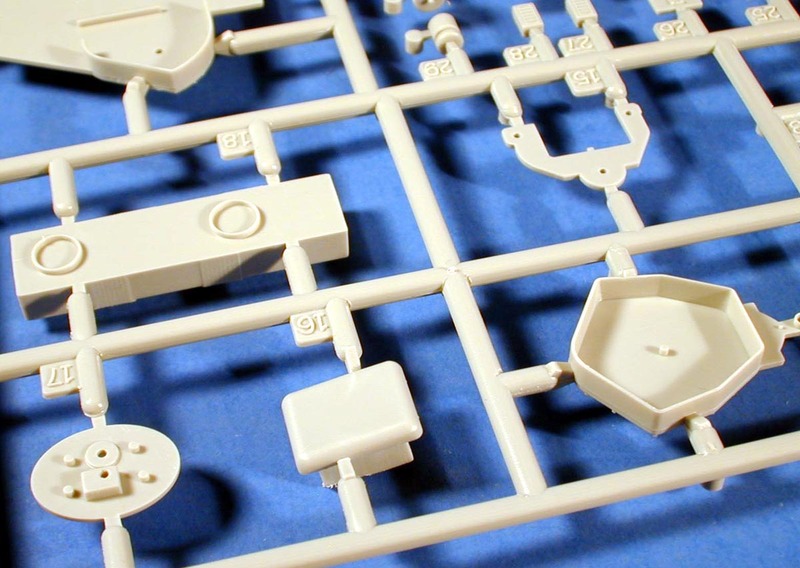 In the past some manufactures simply left detail off rather than complicate the mold to include it. 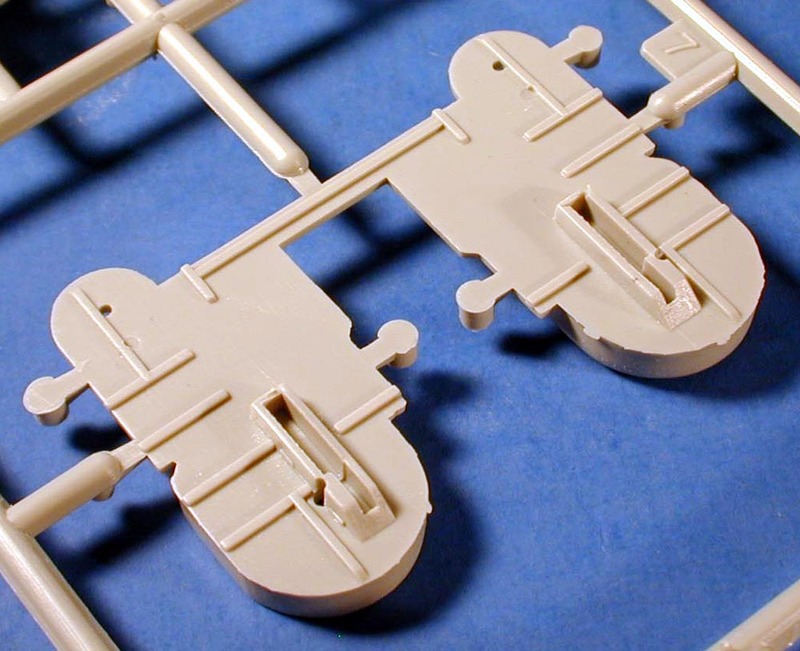 Here we see an example of a manufacturer designing a mold to produce the most detail possible. 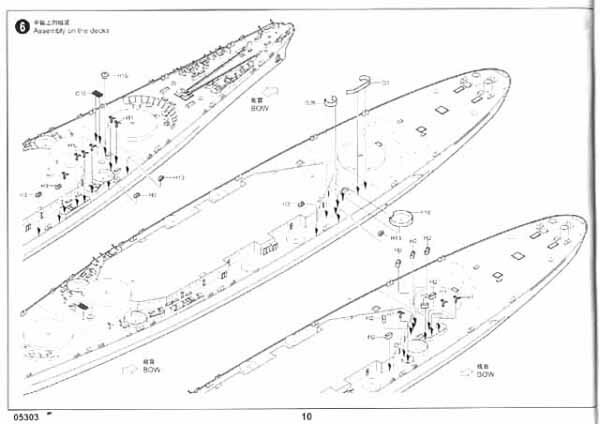 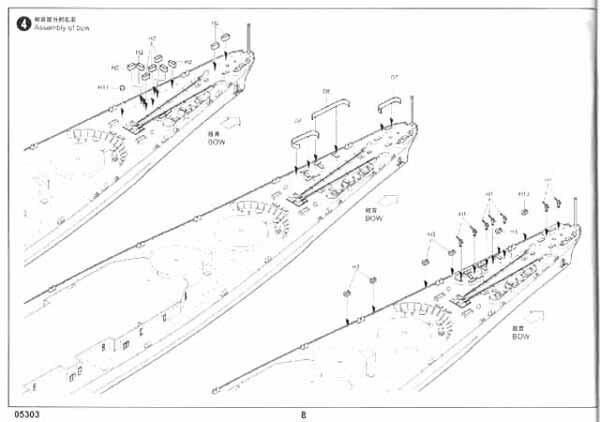 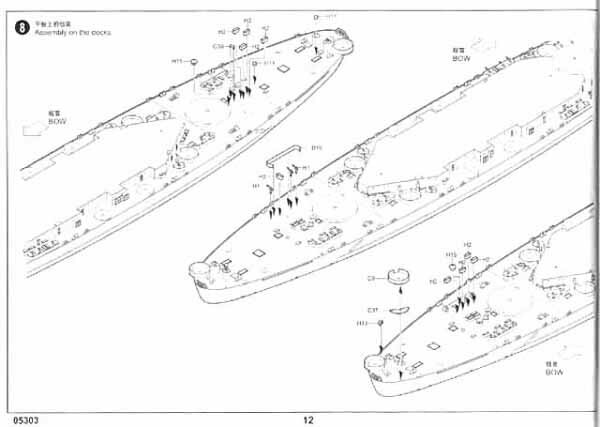 This is exemplified by the design of the twin 5" 38 cal gun turrets. 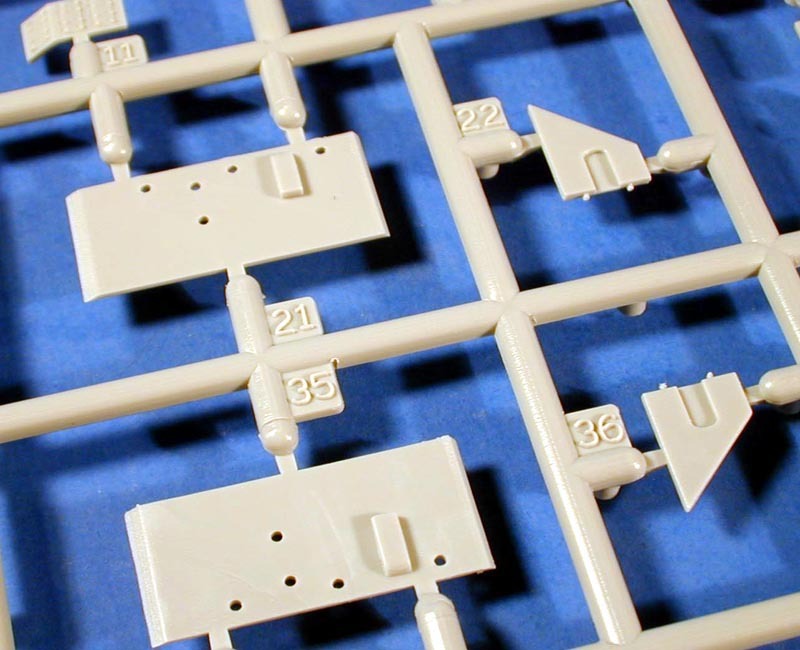 They feature separate sides and backs to allow detail to be molded on all sides. 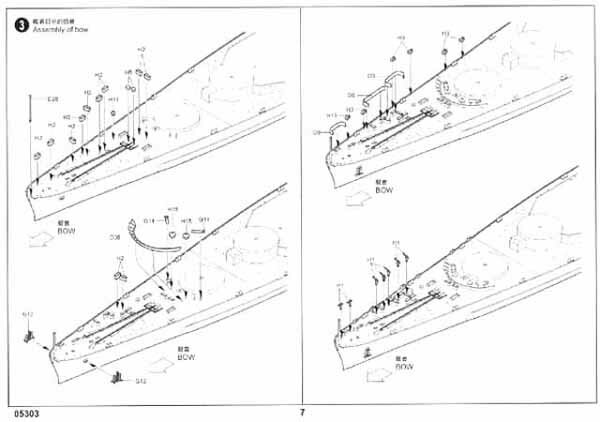 The parting lines on the gun directors show a little flash, but also the extra steps Trumpeter took to preserve the details. 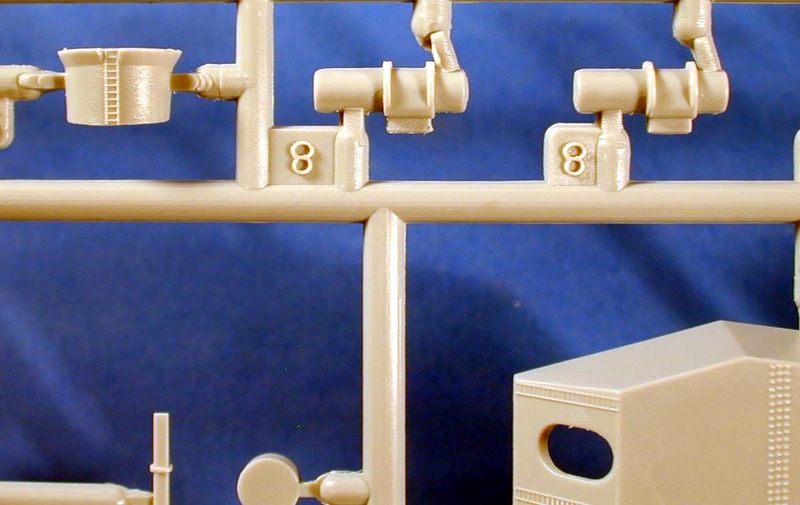 Life rafts and other details are exceptional in their detail. 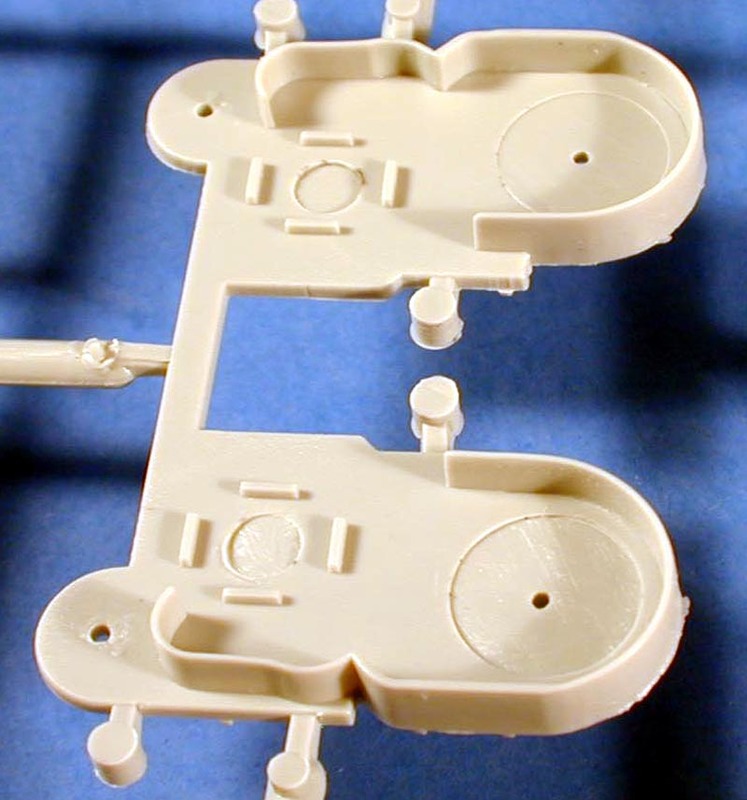 There are two of these spues in the kit. 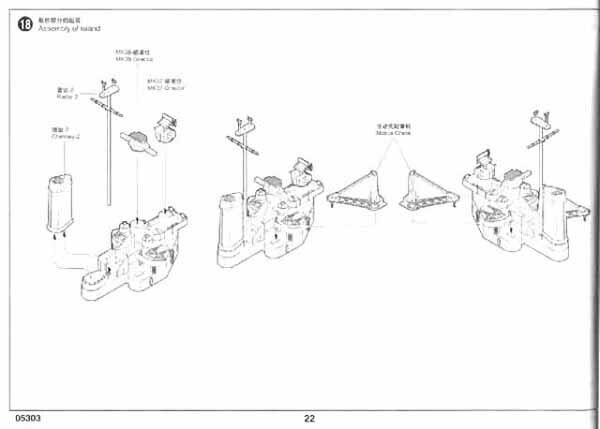 The search lights are awesome with shutter detail and nice framework. 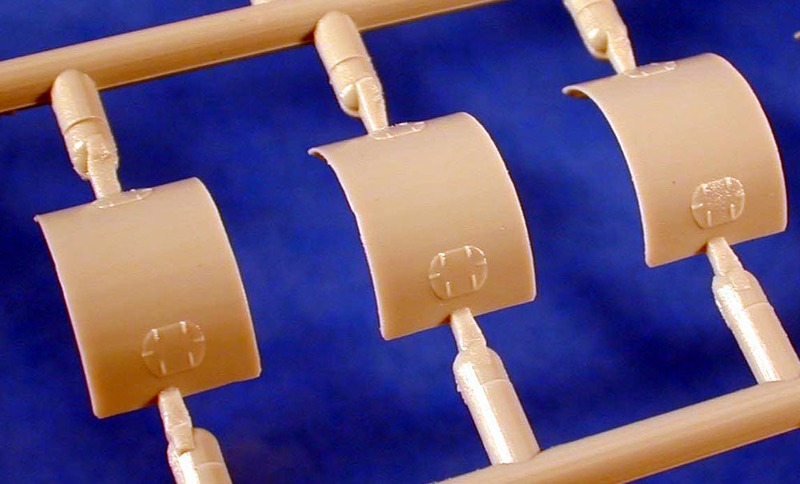 Separate open and closed chocks are included. 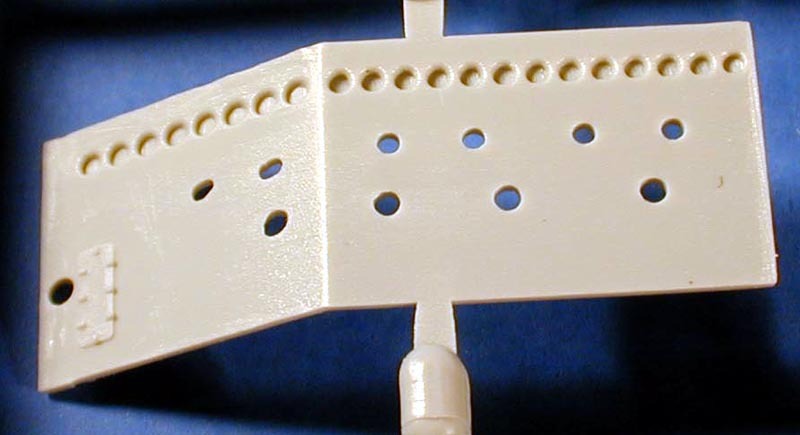 There are two of these frets in the kit. 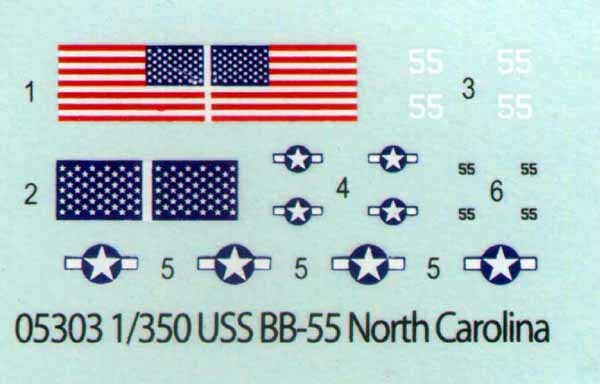 A simple decal sheet is included with flags, hull numbers, and aircraft ensignia. 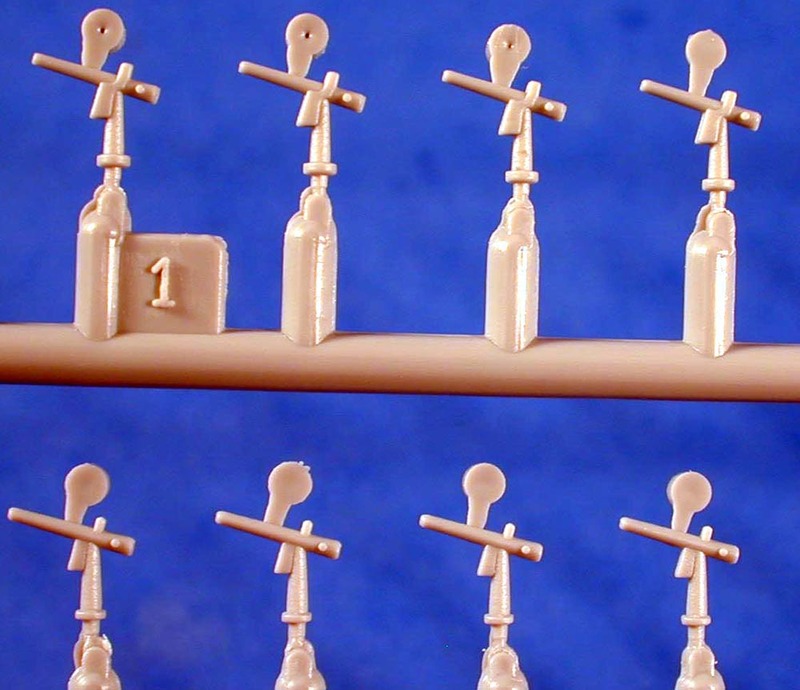 They are well registered but only include numbers for the North Carolina. 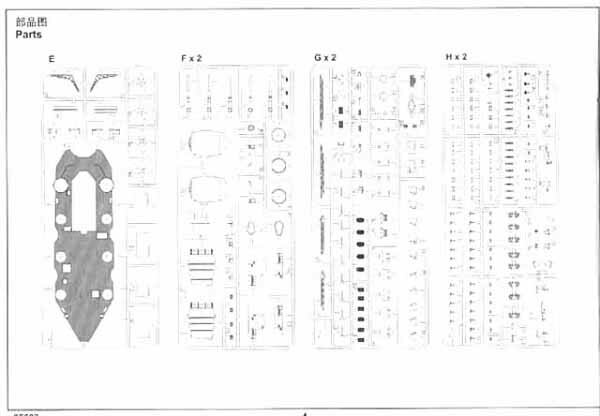 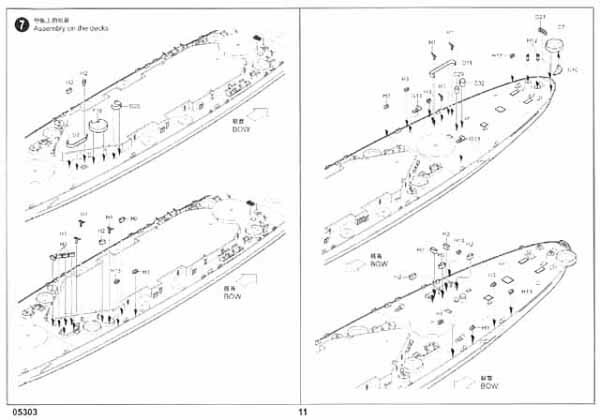 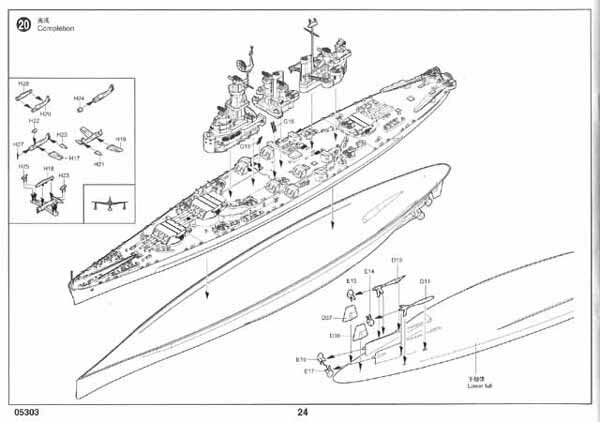 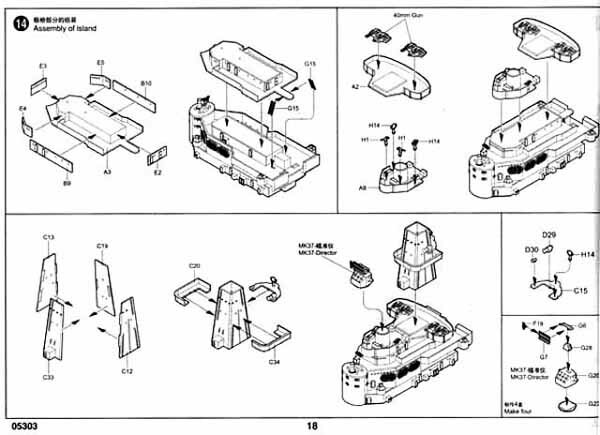 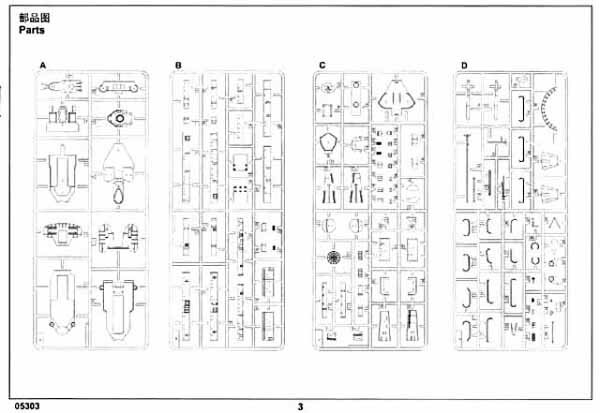 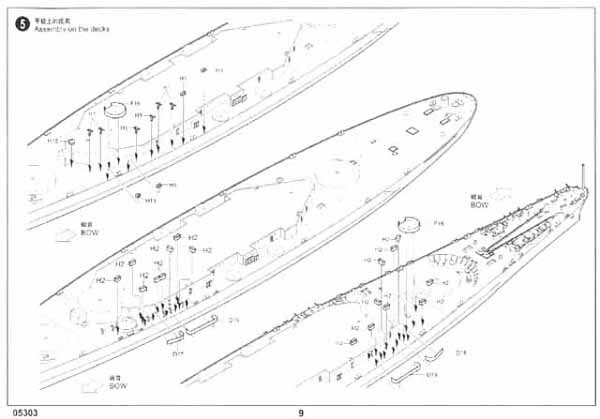 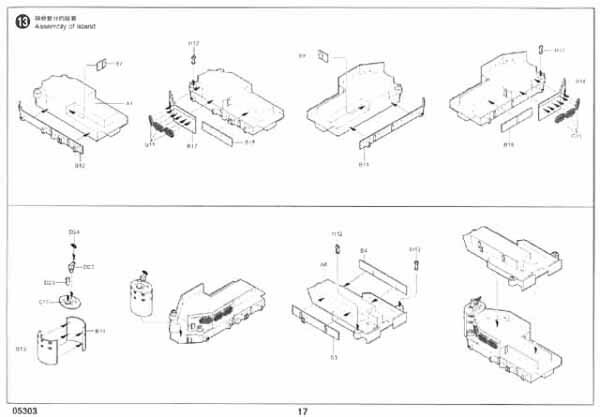 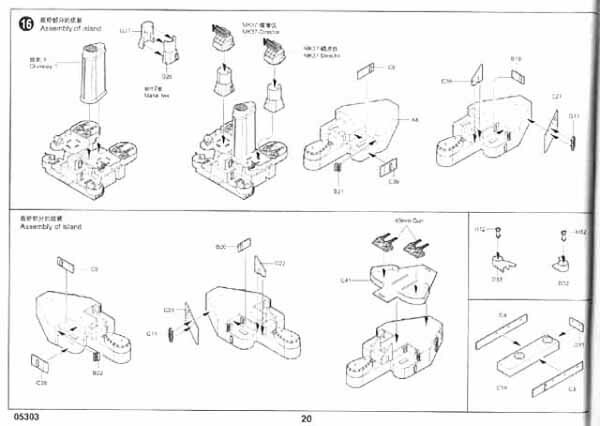 The instructions are an extensive 24 page booklet with all kinds of exploded views. 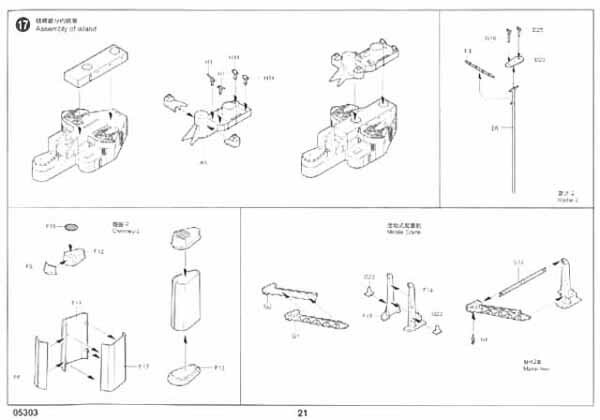 They are step by step and cover all the assembly steps. 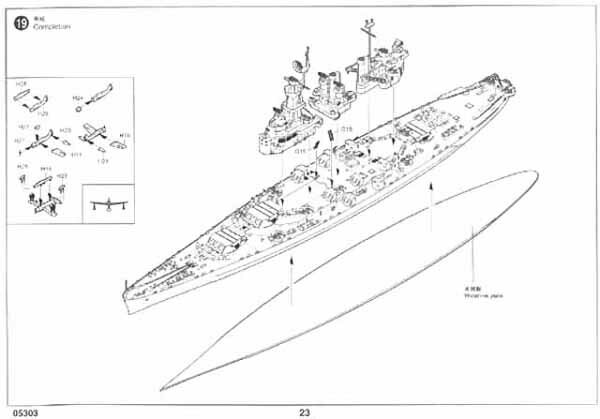 A large 11" x 17" folded color camo guide shows the colors in detail. 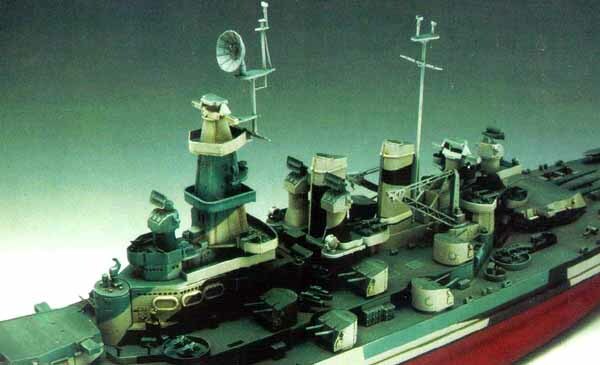 Yet another impressive kit from Trumpeter. 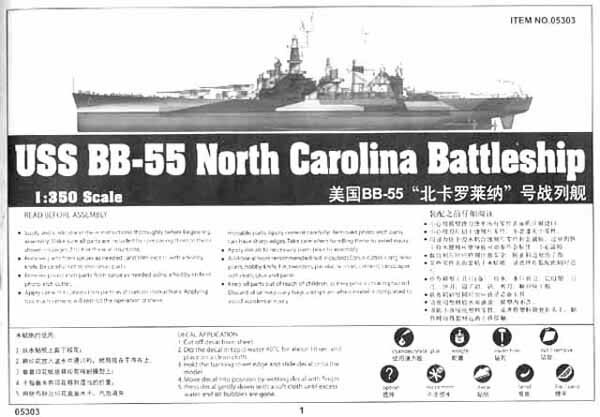 This is kit TSM-5303 1/350 USS North Carolina BB55 Battleship with a suggested list price of $114.95. 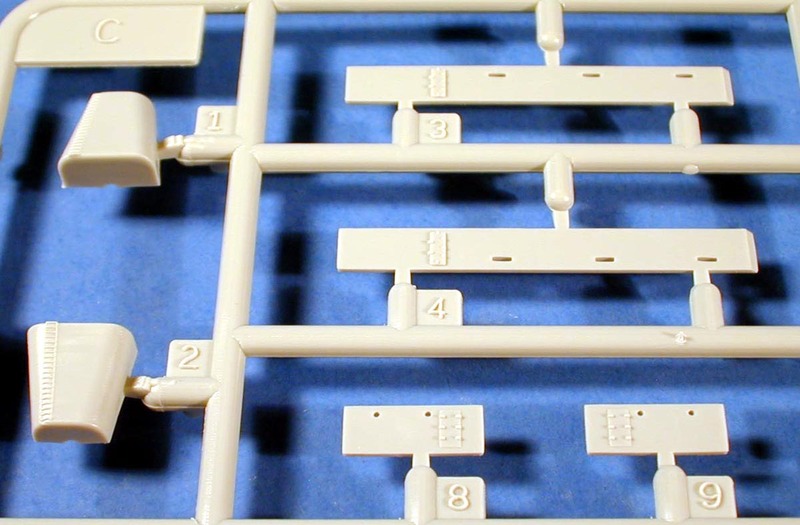 Thanks to Stevens International for the review sample. 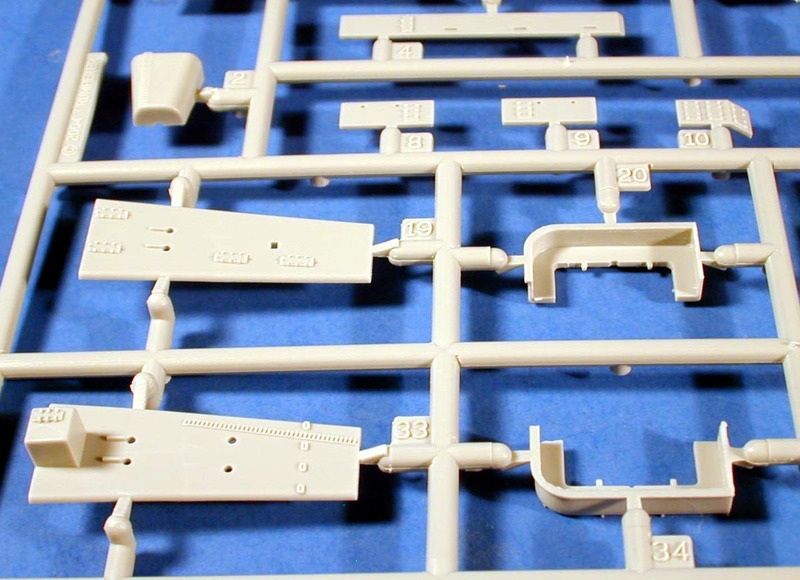 They are the exclusive importer for Trumpeter kits in the US. 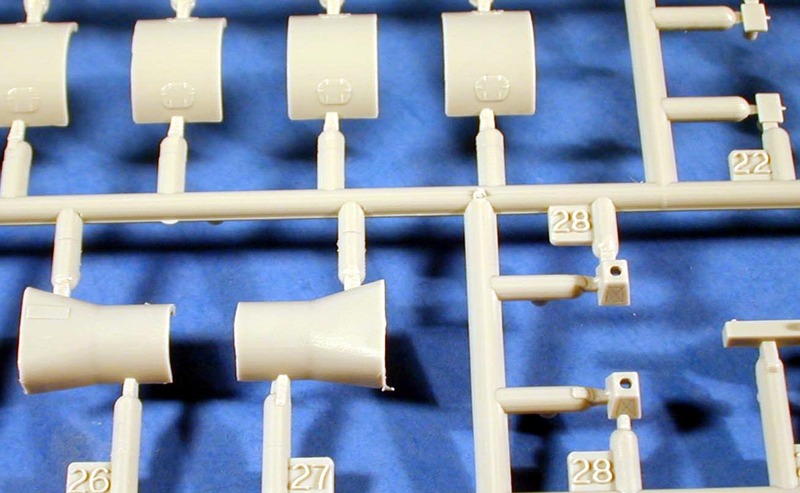 If your hobby shop does not carry Trumpeter kits have them contact Stevens International or try their Hobby Shop Locator to find one.